“The practice of some producers of printing their name on the margins of their films goes back to very near the beginning of cinema and virtually ceased at the time of the first world war, although there was some slight use thereafter. Note that the edge marks are sometimes very faint and need to be looked for. The illustrations all show good clear examples. “The principle here is that each frame of film is photographed in a camera through an aperture more or less the size of one picture frame. Today there are very precisely formulated international standards for the dimensions of the camera aperture, so that virtually all cameras and the film exposed in them, (except for special formats), are identical in this respect; but in the early years of the industry there was no precise standardisation and the exact size and shape of aperture varied from maker to maker and from user to user. Some producers adhered to camera and printer aperture characteristics of their own, by which they may be recognized. If the camera aperture is of somewhat less height than the length of film used for each frame, there will be a line of unexposed film between each frame of negative. This will appear as a dark line on a positive print (a wide frame line). If the aperture height is exactly equal to the length of film used for each frame, then there will be no unexposed “frame line” and each frame of picture will exactly meet the adjacent ones. 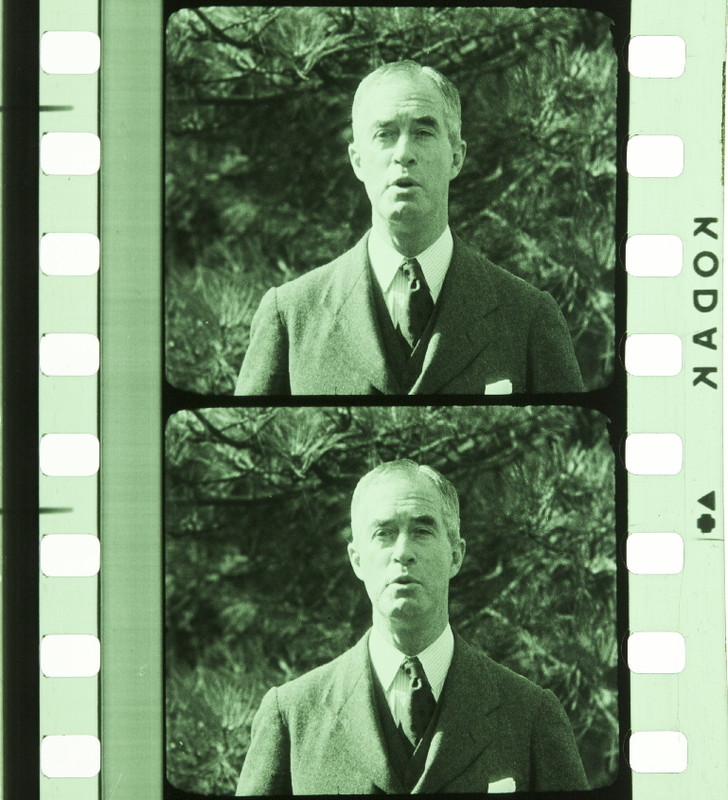 It is also possible for the aperture height to be greater than the length of film used and so each frame will overlap the next, and between each frame of negative there will be a strip exposed twice. This is found only rarely, however. In this case the “frame line” area will appear lighter than the adjacent picture on the positive print, being composed of overlapping portions of the two picture frames. The width of the camera aperture may be exactly the width of film between the two rows of perforations. It may be less, in which case the picture will not extend the full width between the two rows of perforations and there will be a blank border each side, which will be transparent in negative and could be printed black in positive. The width of the aperture may be greater than the width of film between the two rows of perforations, so that the picture spreads onto the perforation area. The rectangular shape of the aperture may be a perfect sharp-cornered rectangle; or the corners of the aperture may be rounded to greater or lesser degree. The negatives made in the cameras were printed. Here it is necessary to explain that when printing copies of films from the negative which is made in the camera; there are two different methods. (a) Frame by frame (or step) printing. In a step printer, the negative and the unexposed positive copy film are passed through the gate of the printing machine in the same way as film passes through the gate of a camera, or of an ordinary projector, i.e. one complete frame at a time. The printer gate has an aperture approximately the size of one frame, and complete frames are printed one after another. In a print made by this kind of printer the printing aperture also images its shape on each frame of the film, in a manner similar to the camera aperture. Thus on a print made on a step printer we may be able to see the image of both camera aperture and printer aperture. During the first 20 years of cinema, most prints were made on step printers. 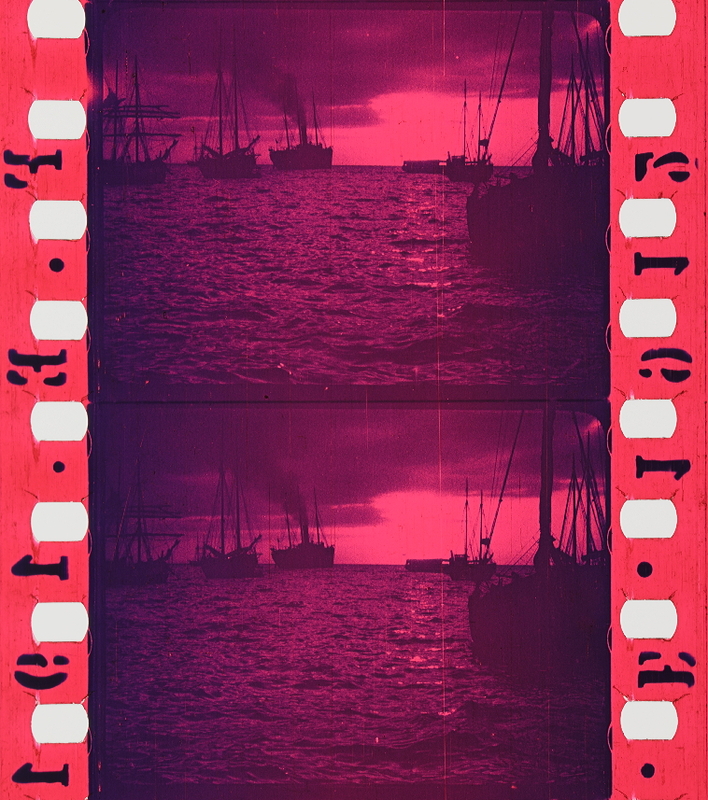 In a continuous printer the negative, and the positive print film are drawn smoothly (not frame by frame) past an illuminated slit and the positive is thus exposed. In this case there is no frame-size aperture to image its shape on the print as in a step printer. By the differences in camera and printer aperture, which can be seen by looking at the film itself (but which do not appear on the screen), we can recognise in some cases the films of different producers. There is a further feature to look for in this connection. This is the position of the frame line in relation to the perforations. 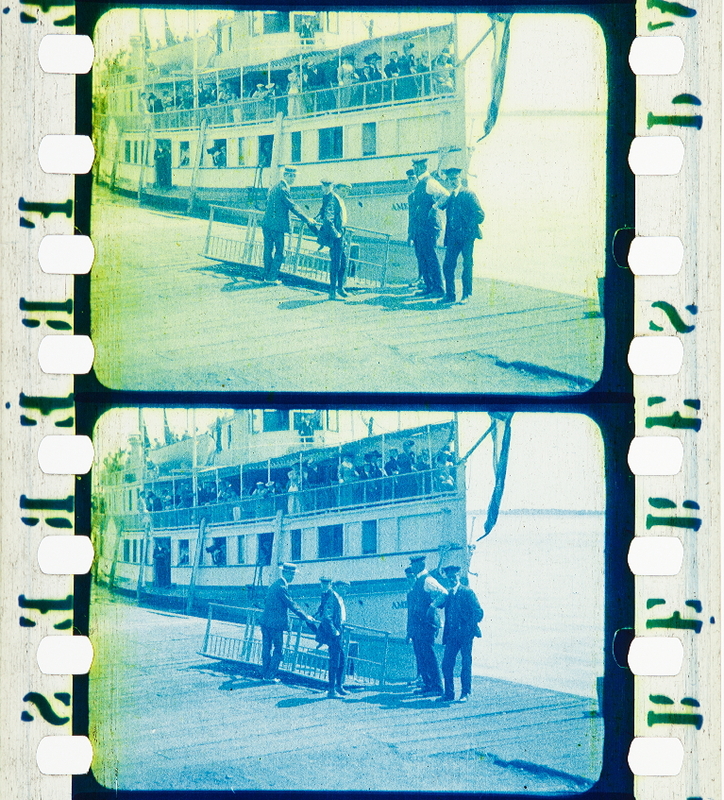 For many years past the position of the frame line has been standardised midway between two perforations, but during about the first 20 years of the cinema, while some makers had the frame line lying level with somewhere in the space between the perforations, some had it across the middle of the perforations, and indeed it might fall on any intermediate position. This is a further characteristic which points to a film being made by certain particular producers. A number of illustrations are provided: For purposes of description of the position of the frame-line in relation to the perforations I distinguish; mid space, top space; bottom space; mid perf; top perf; bottom perf. One will not necessarily always be able to say, from comparison with the illustrations, that a specimen is from a certain maker; but one may well be able to determine certain makers whose product it is NOT, which still helps towards identification. “Letters and other documents commonly formed part of the story of films of this period. Some European producers sometimes put their letters on squared paper. This is not seen on British or American films. It is noticeable and valuable that when letters, cheques, telegrams, calendars and the like, had dates on them, these were universally current dates. So such dates may reliably be taken as the time of production of the film; except where the film is clearly representing some other historical period. As examples see:- 1. (Ill.L.3) The date on the cheque is ‘May 26,1915’. 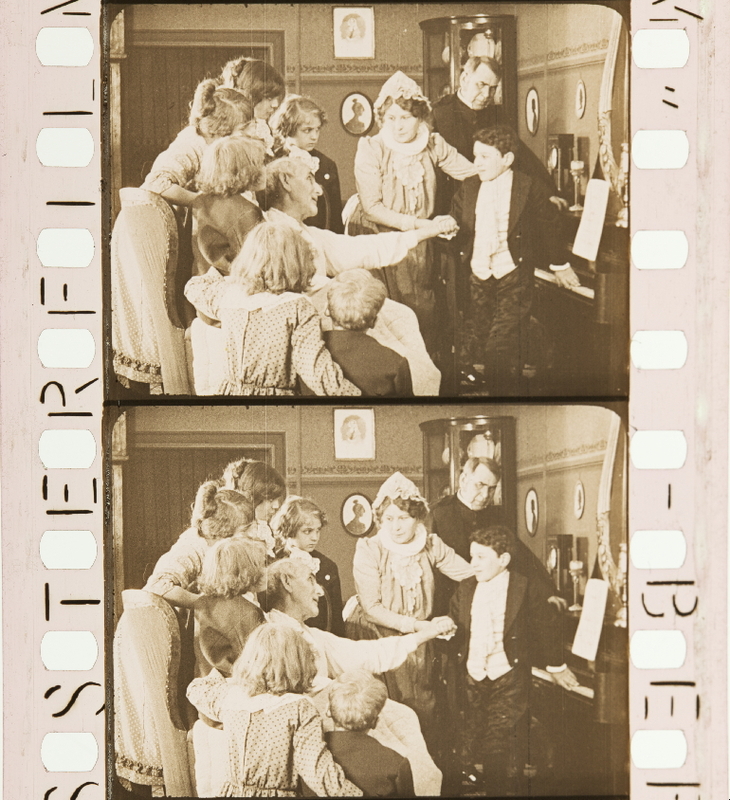 This is from the Thanhouser film Madame Blanche: Beauty Doctor (Reviewed in the Bioscope 10. 07. 1915). 2. (Ill.L.4) The date of the pardon document is ‘May 20,1915’ This is from the Thanhouser film Telephone Tragedy (Reviewed in the Bioscope 07.10.1915). 3. 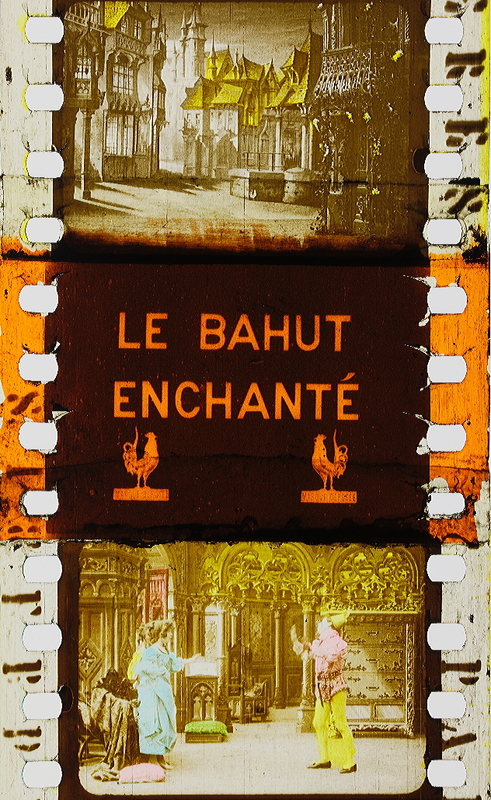 (Ill.L.6) The date in the middle of the banknote; “PARIS le 3 Avril 1909”, conforms with the date of the Eclair film in which it appears, Absent Minded Doctor, (Reviewed in the Bioscope 08. 09. 1910). Look very carefully; the date is very difficult to read. “Until about 1905 the size of perforations was smaller than the present standard ‘negative’ or ‘positive’ perforations, (Ill.P.1/2). These were of different precise shapes as shown by these illustrations; see also (Ill.FC.1-14 & 16/17 & 19/20). From that time a change to larger perforations, similar in shape to the present negative perforation, gradually took place, (Ill.P.3). This is also known as the ‘Bell and Howell’ perforation (B.H.) after the engineers who devised its precise dimensions. 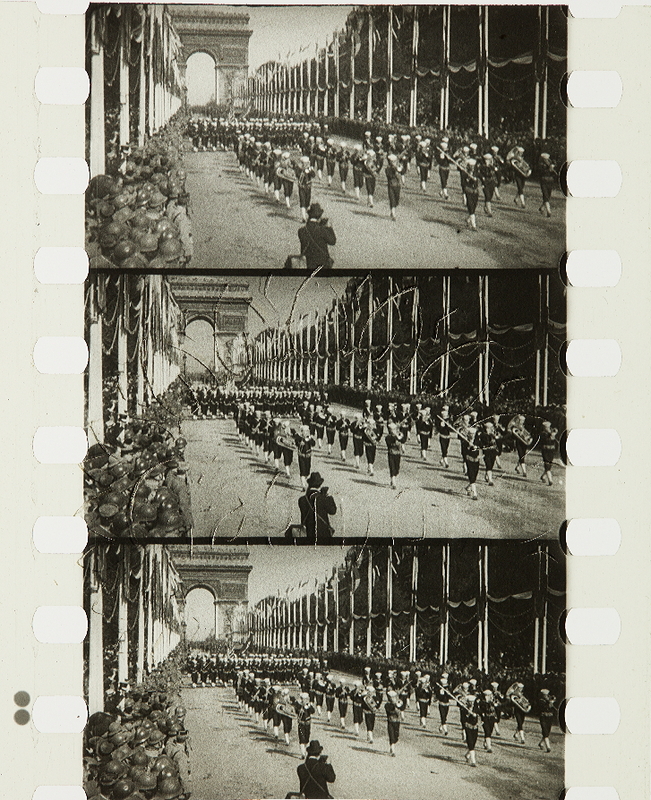 Perforations of this shape and size were then used for all films, both negative and positive until 1924. “Some producers used a consistent style of main and inter-title, and also changed that style from time to time. Thus one can, in those cases, deduce a period within which a film was produced by reference to the style of main or inter-title used in it. Der Märchenwald – Ein Schattenspiel (GER 1919). 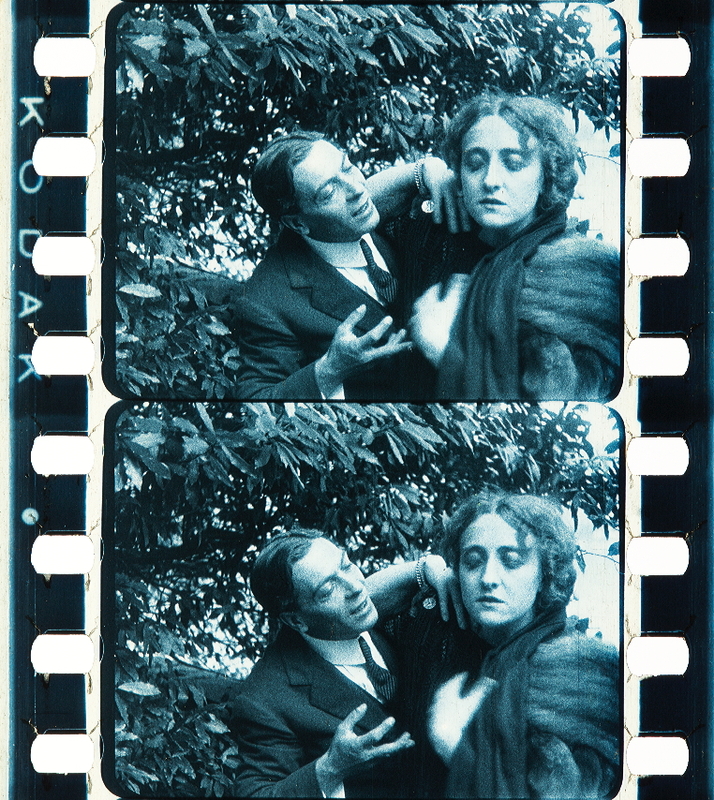 Credit: By courtesy of Deutsche Kinemathek. 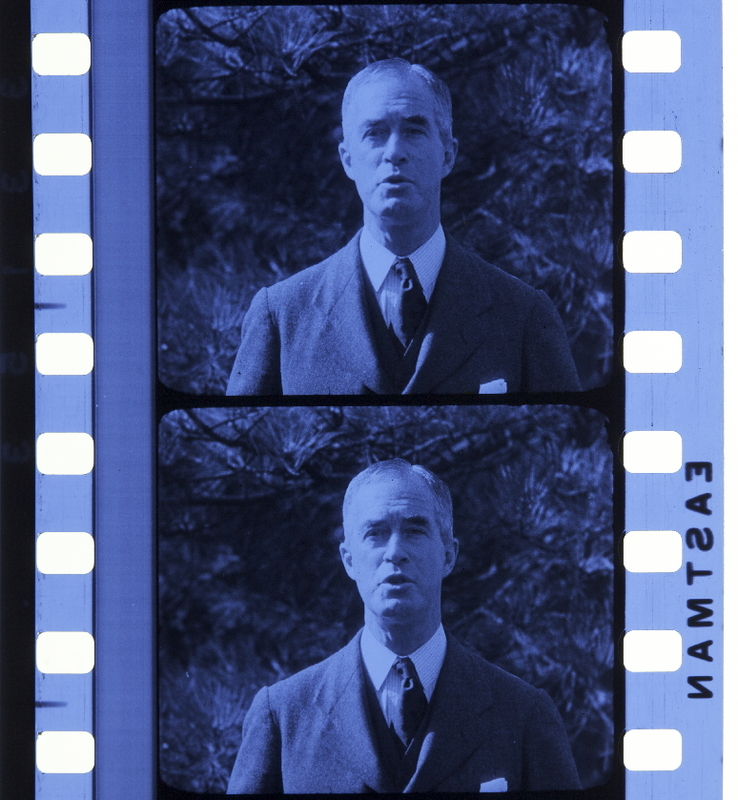 Photographs of the tinted nitrate print by Barbara Flueckiger. Der Alpenweg. Sallanches, Gombloux, Megeve (CH ). Credit: Lichtspiel Kinemathek Bern. 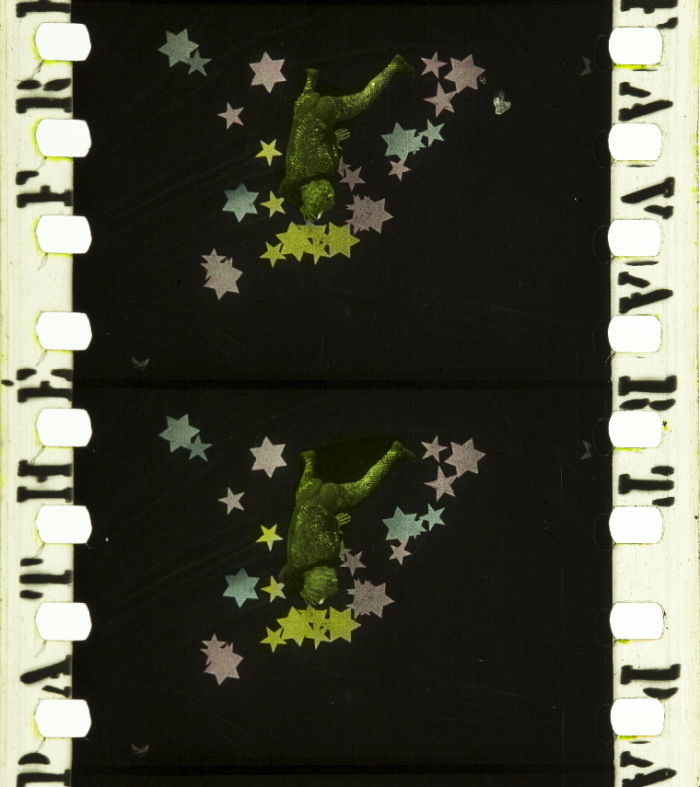 Photographs of the tinted and toned nitrate print by Noemi Daugaard, SNSF project Film Colors. Technologies, Cultures, Institutions. [Emelka Woche 1928 /28 & 30] ( ). Credit: Lichtspiel Kinemathek Bern. 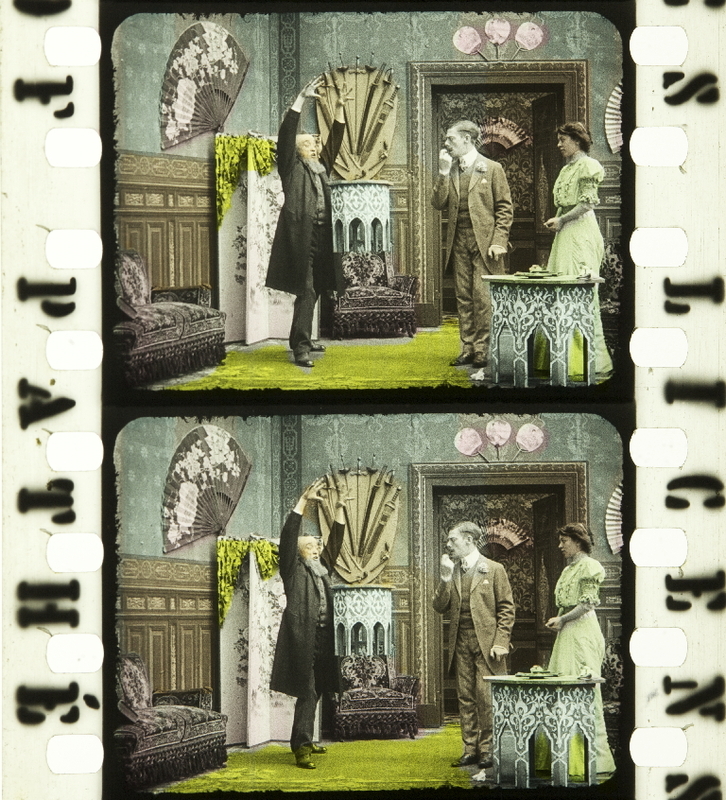 Photographs of the tinted, toned and stencil colored nitrate film by Barbara Flueckiger. Didone abbandonata (ITA 1910, Luigi Maggi). Credit: Cineteca di Bologna. 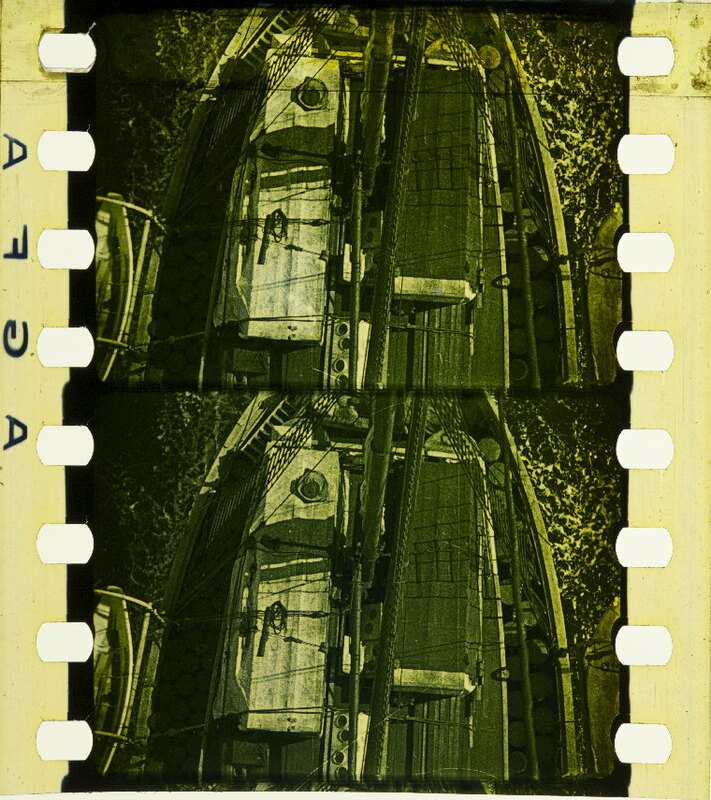 Photographs of the tinted nitrate print by Barbara Flueckiger. 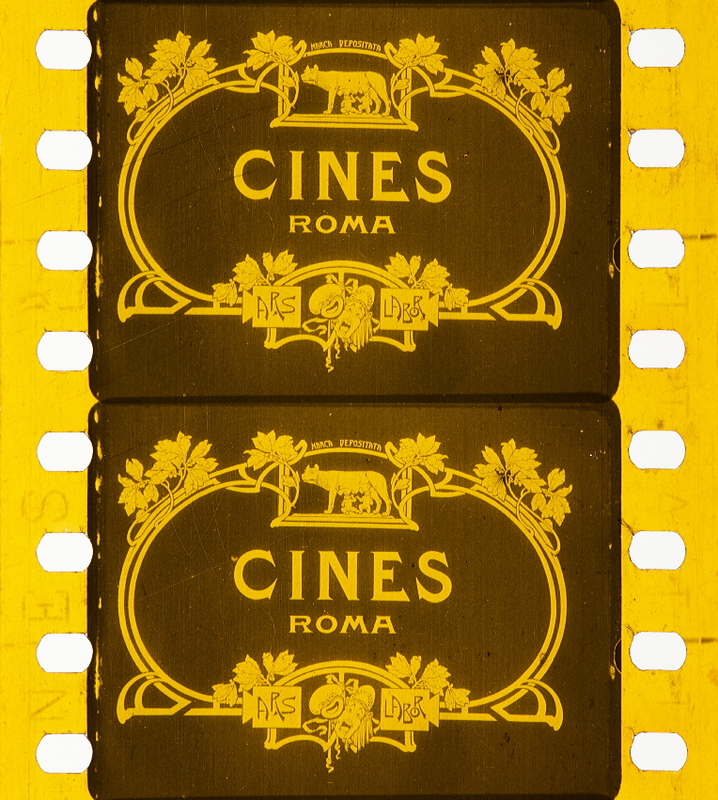 Almost all the films of the years 1909 through 1912 carry the edge mark ‘SOCIETÀ ITALIANA “CINES” ROMA’ (Ill.PM.11). 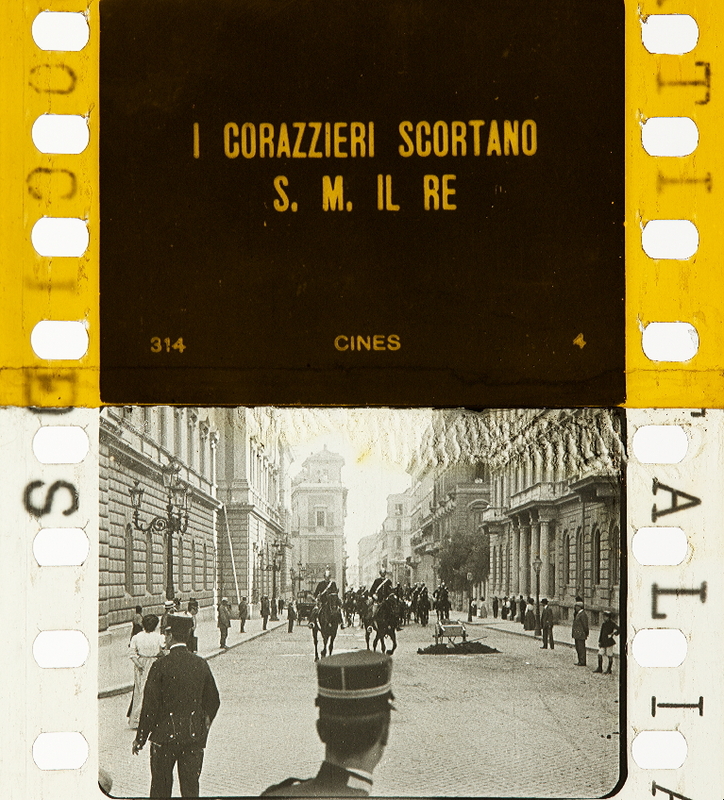 I corazzieri italiani (ITA 1910, Società Italiana Cines). Credit: Cineteca di Bologna. 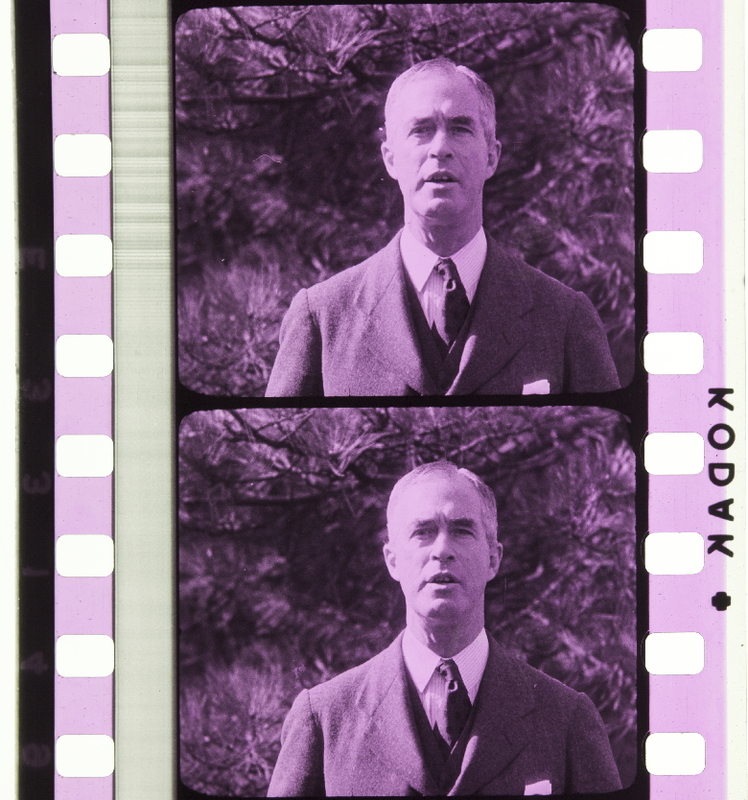 Photographs of the tinted nitrate print by Barbara Flueckiger. 1. The boundary of the actual picture has deeply rounded corners. “I have examined 57 films of Cines of the years 1909 to 1914. Cines changed the style of their main and inter-titles from time to time, and in the absence of other clues this may help with some indication of date of the films. In 1909 they used a form of trade mark on the main titles consisting of a wolf with two babies, (Romulus and Remus) and the name CINES beneath it. (Ill.TS.17) The associated inter-titles were of style (Ill.TS.18). None of the Cines films of 1912 in the N.F.A. has a main title, they are all missing; so I have no evidence as to their style. The N.F.A. has three Cines films of 1913 with their original main titles, and these three all incorporate the name ‘Cines’ into a five-petalled flower motif (Ill.TS.23). 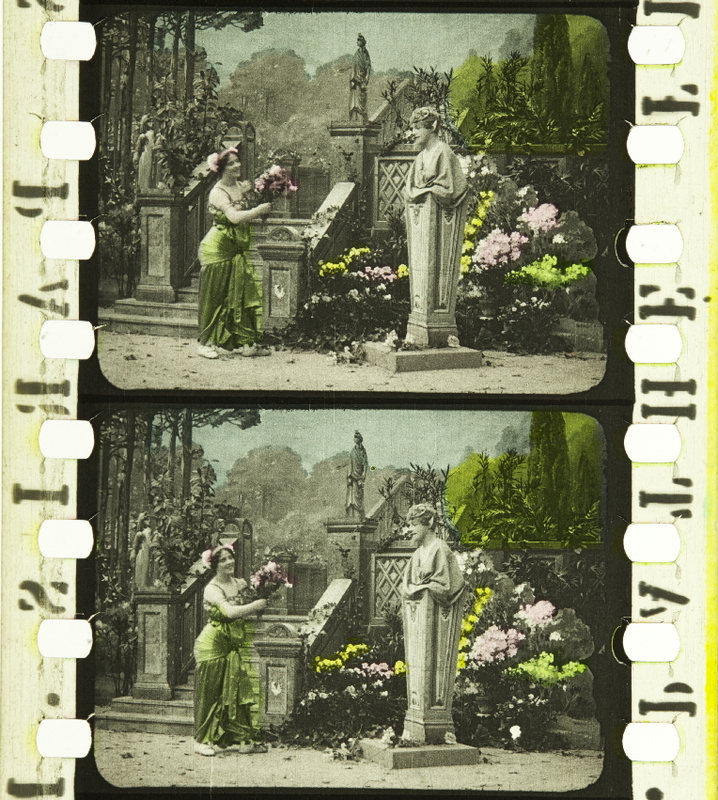 Among the films of 1913 the floral motif appears in two different sizes. I know of no significance to this. Most of the inter-titles of 1913 are as (Ill.TS.24), but two from early 1913 are different (Ill.TS.86 & 88). 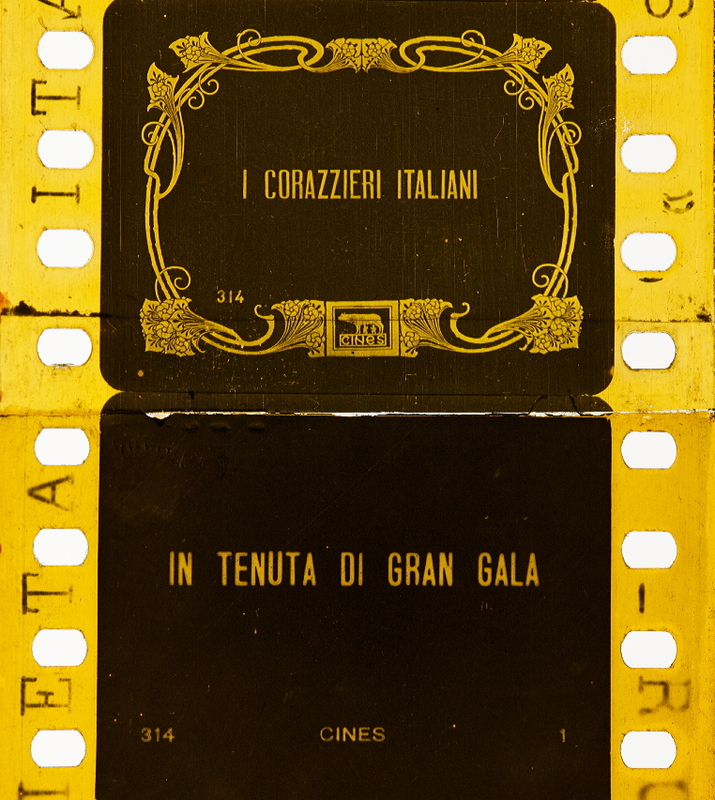 Some of the titles of Cines films are printed with sharp square corners to the frame and some with rounded corners. I have found no useful significance to this variation. In some of the titles the wording is all in capital letters, while others use both capital and small letters. (Ill.TS.20/21). I have found no consistency in the use of the two practices which can help with dating. 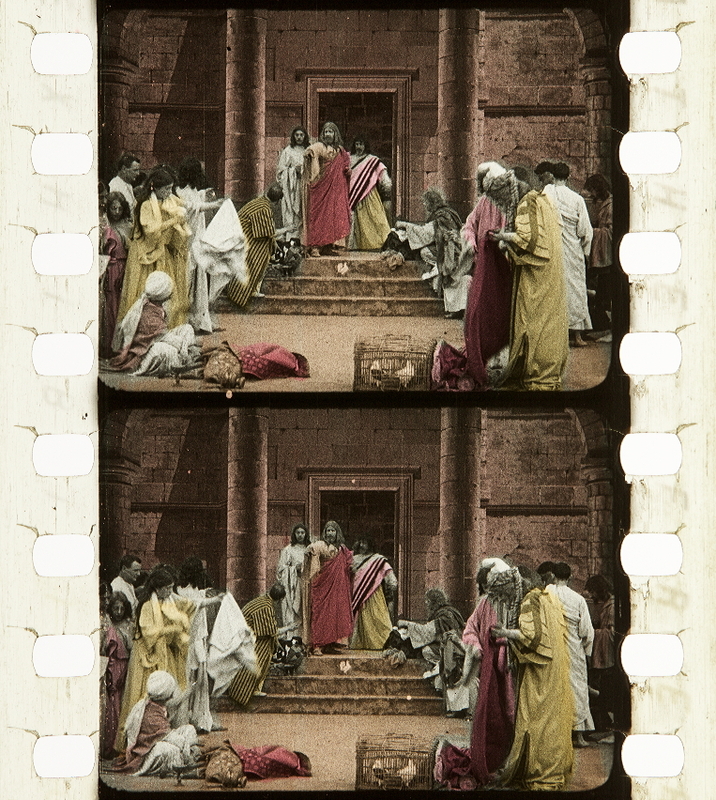 Massafra (ITA 1911) Credit: Cineteca di Bologna. Photographs of the tinted, toned and stencil colored nitrate print by Noemi Daugaard, SNSF project Film Colors. Technologies, Cultures, Institutions. “The list is arranged in order of serial number. The serial numbers and the dates of review do not follow in exactly the same order but do approximately so. The one exception to this is number 314 which should be about October 1910. No review at this time has been found, but it does appear in the Bioscope in March 1915. I guess that what happened is that in 1910 the film was not considered of sufficient interest to British audiences to distribute it in Britain, but in the circumstances of the war during 1915 there was felt to be a market for it. On some titles the serial number appears in the bottom left-hand corner and in others in the right-hand corner. Sometimes this variation exists within a single film. I find no informative significance to this. Some details of some films on the list are left blank. This is because we do not have the particular piece of information. e.g. if we have only a duplicate copy of the film, this will have no information about the tinting, and any edge mark which was on the original may not have been copied onto the duplicate; some short comic films had no inter-titles, so there can be no information about title style; where the main title is missing there can be no information about the style or tint of it. The original Italian title is given first when known. This is followed by the English title when known, which is followed by the title in the language of the copy in the Archive, when this is not English. This is the date of the first known mention in the British trade press, in the order ‘day’, ‘month’, ‘year’. Main Title style. The entries in this column refer to the illustrative figures. The Tint of the Main Title. Inter-Title style. The entries in this column refer to the illustrative figures. The Tint of the Inter-titles. (Colour letter as Main Titles). There is an asterisk ‘*’ in this column when the film has the Edge Mark ‘SOCIETA ITALIANA “CINES” ROMA’. 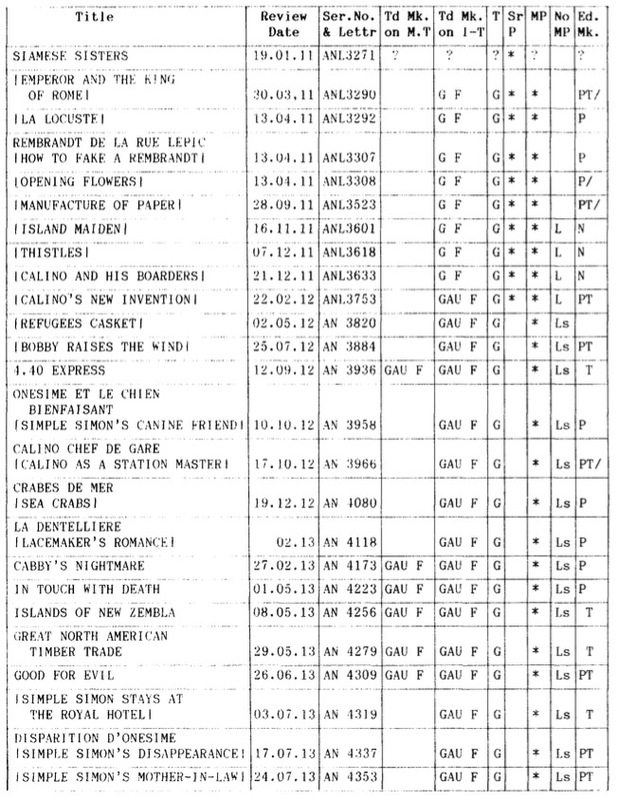 The entry in this column indicates the Language of the Titles in the copy examined. The letter is the initial letter of the Italian name of the language and appears on the titles. I = Inglese = English. T = Tedesco = German. S = Spana = Spanish. This feature is not on the film. We do not have this information. This may be because we only have a duplicate which does not show this feature; or because the film is not in our own archive and we are thus not able readily to inspect it. King of Italy’s Bodyguard has its own special design of main title. Eclair of France actually printed the year in the margins during 1910 to 1913 with a mark which appeared in several forms, (Ill.PM.21-28). In (Ill.PM.21) the name KODAK has clearly been put there by the producing company, and not by Kodak, supposedly as some claim to the quality of the print. One wonders whether such action may have had influence on the Eastman Kodak Company themselves placing their name on the film three years later. (Ill.PM.23) does not actually have the name ‘Eclair’. (Ill.PM.26) has an ‘x’ before each fourth repetition of the name and year on one side. Comment le soleil se couche (FRA 1913). Credit: Cineteca di Bologna. 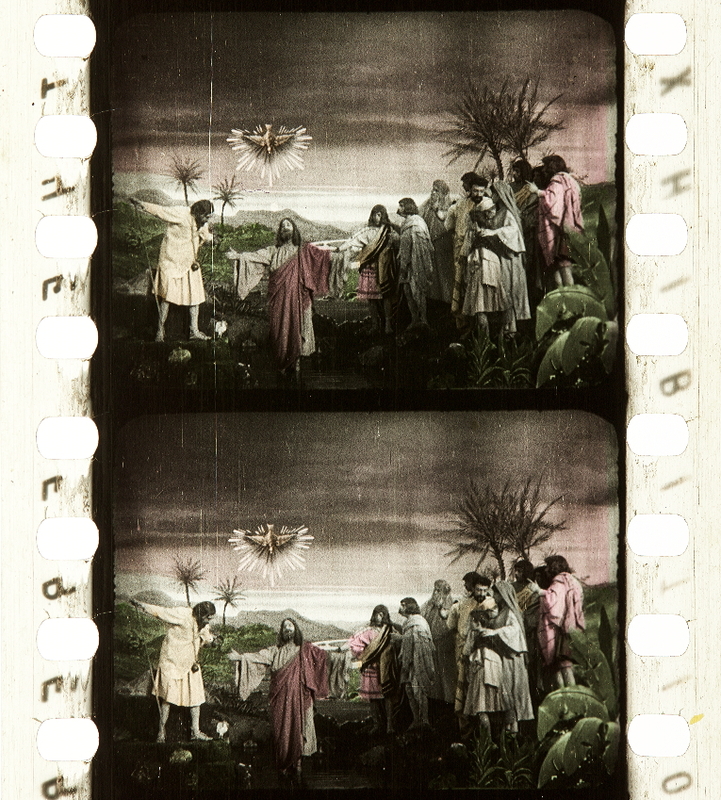 Photographs of the tinted and toned nitrate print by Barbara Flueckiger. “Eclair used different styles of main titles and inter titles at different periods. These are illustrated in the TITLE STYLES and the styles of title used on each of the films which have them is shown in the film list, main titles (Ill.TS.45-48), inter-titles (Ill.TS.99-109). On all the inter-titles there is a number indicating the order of the inter-title in one of the bottom corners. On most, the diamond-shaped Trade Mark has a dark back ground. On (Ill.TS.105 & 106) the diamond is white. In (Ill.TS.106) there is a circular emblem with some German wording in it. This probably appeared only on copies circulated in Germany. (Ill.TS.109) comes from a copy circulated in America. Note that the same film has PM.28. The two films which we have of 1915 use the convention of a plain ground for speech titles. Eclair made a series of films with a mischievous small boy. His name was variously rendered, sometimes within a single film, spelled either ‘Willie’ or ‘Willy’. Also he was sometimes called ‘Little’ Willie or Willy and sometimes not. In the film list I have used the form on the main title where there is one, or the form used in the Bioscope reference in other cases. Further to this confusion of names, some other producers had films about characters called ‘Willy’ or ‘Willie’. It is wise to consider any cases carefully, and study the edge marks, title styles and frame characteristics of any film being examined. Explanation of abbreviations used in the film list. The original French title is given first when known; then the English title when known; then any other language title known. This is the date of review or other mention in the Bioscope, in the order ‘day’, ‘month’, ‘year’. The production serial number when it appears on the film copy examined. The entries in this column refer to the illustrations [of main titles]. The entries in this column refer to the illustrations [of inter-titles]. 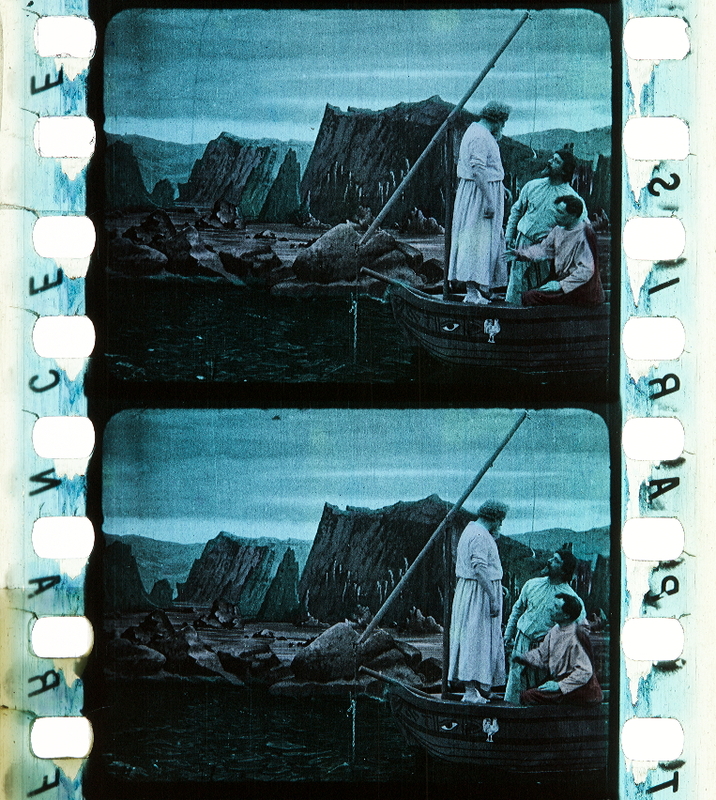 The film has the edge mark shown in the given illustration number. ‘N’ means that there is no edge mark on the film. There is no illustration of the 1911 mark; this reads “F.E. PARIS 1911”. The language of the titles on the copy examined. E = English; G = German; S = Spanish. The feature does not exist on the film, or is missing from the copy examined, or is represented only by replacements. (This refers to Edison’s early small-perforation films not to the Edison company’s films of c.1906-15). (Ill.FC.13). This also has black margins, but has a quite different appearance from the prints of Paul. See that between the perforations of the positive, there is the image of the perforations of the negative. In making the print; the perforations of the negative and of the print film do not co-incide. This is so in all of the few early Edison prints I have seen. 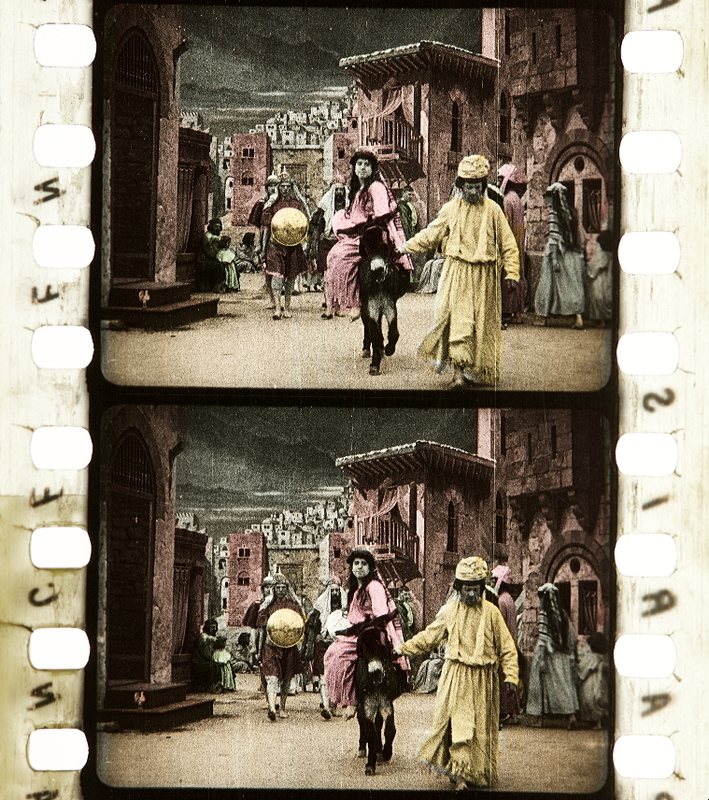 Many Essanay prints had the thick black frame line and black borders, identical to the Kalem films. See (Ill.FC.53). 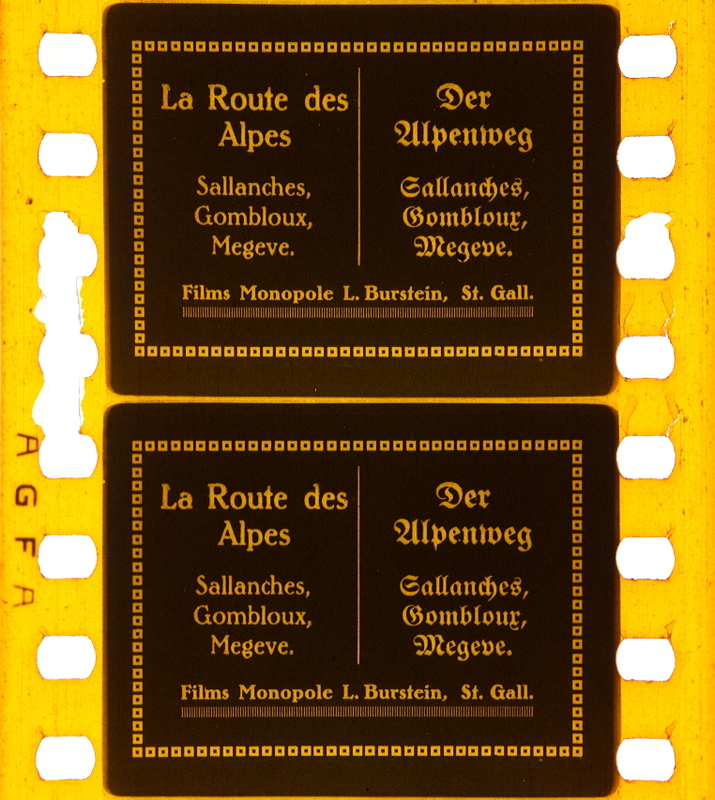 The earliest Gaumont films – before 1907 – had no edge mark. The edge mark started to be included at about the beginning of 1907. If one takes a close look at the edge mark (Ill.PM.8) one can see that between each print of the name “GAUMONT” there is a letter. In the example of (Ill.PM.8) the letter is orientated at 90 degrees to the name GAUMONT. It may be regarded as lying on its back. This interim letter was placed thus sideways throughout 1907 and probably during 1908. In (Ill.PM.9) this interim character is similar to the letter ‘Y’. The three films which the N.F.A. has with the ‘Y’ were all made during 1909 or at the very beginning of 1910. [Gaumont Fragments] Credit: Lichtspiel Kinemathek Bern. 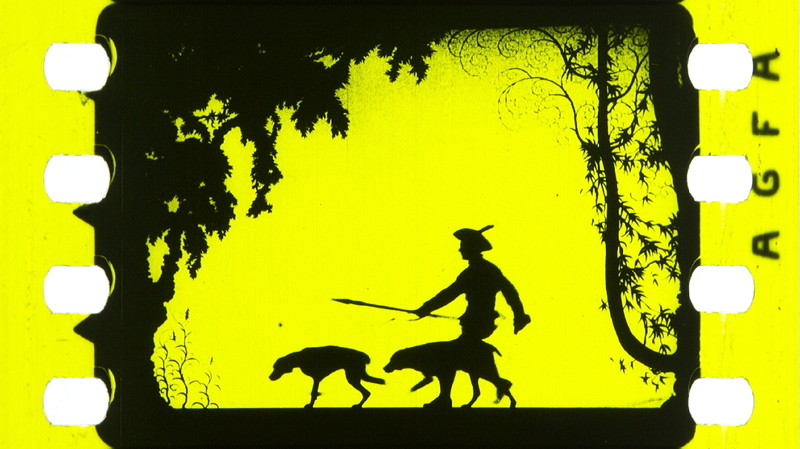 Photographs of the tinted and stencil colored nitrate film by Barbara Flueckiger. “Some of the earlier producers embossed their names or trade marks on the fronts of their films. 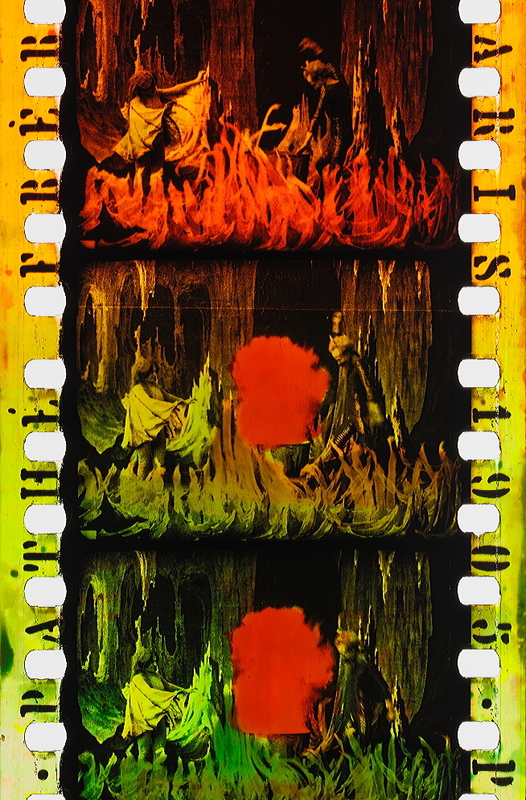 These are not apparent on the screen but may be seen on the film in the hand, if the beginning of the film has not been lost. 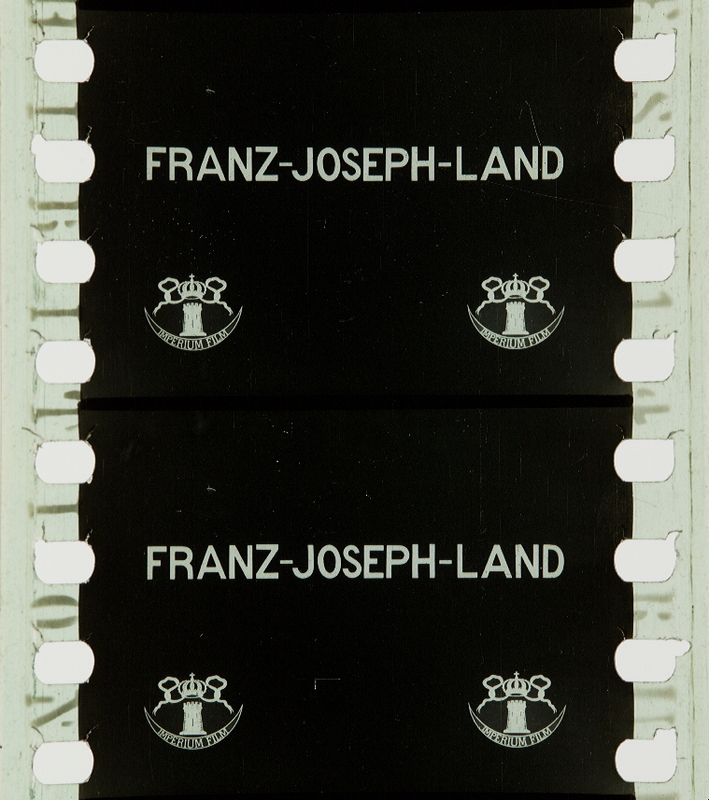 These embossed marks also are usually not apparent on a copy when the film is duplicated. I have produced some specimens by taking pencil rubbings on tissue paper. Some of these are, unfortunately, not very clear because the embossings are not very deep, but they can be discerned with care. The name “ELGE” derived from the initial letters of the name “Leon Gaumont”. Credit: Lichtspiel Kinemathek Bern. 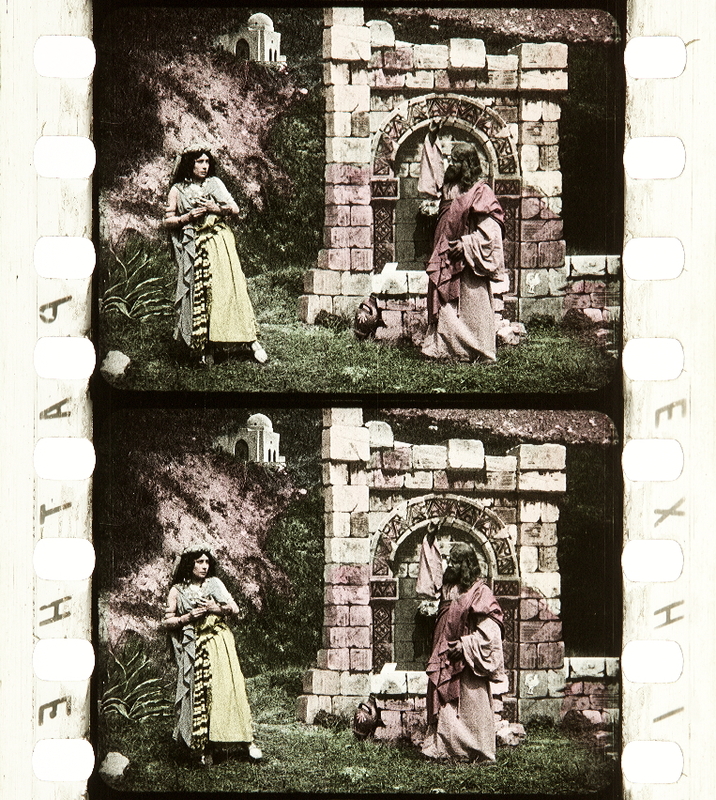 Photographs of the tinted, toned and stencil colored nitrate film by Barbara Flueckiger. 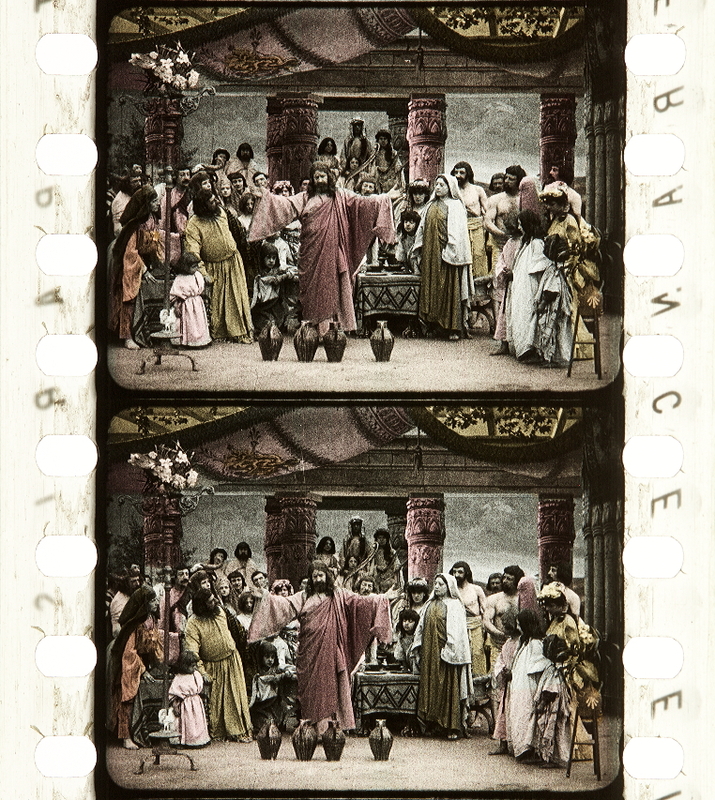 Gaumont prints from 1906 to 1914 have a distinctive appearance. (Ill.FC.37). 1. The frame-line is a very thin line. 2. The frame-line lies mid-perf. Gaumont Chronochrome samples from the Kodak Film Samples Collection at the National Science and Media Museum in Bradford. Credit: National Science and Media Museum Bradford. Photographs by Barbara Flueckiger in collaboration with Noemi Daugaard. [Gaumont Fragments] Credit: Lichtspiel Kinemathek Bern. 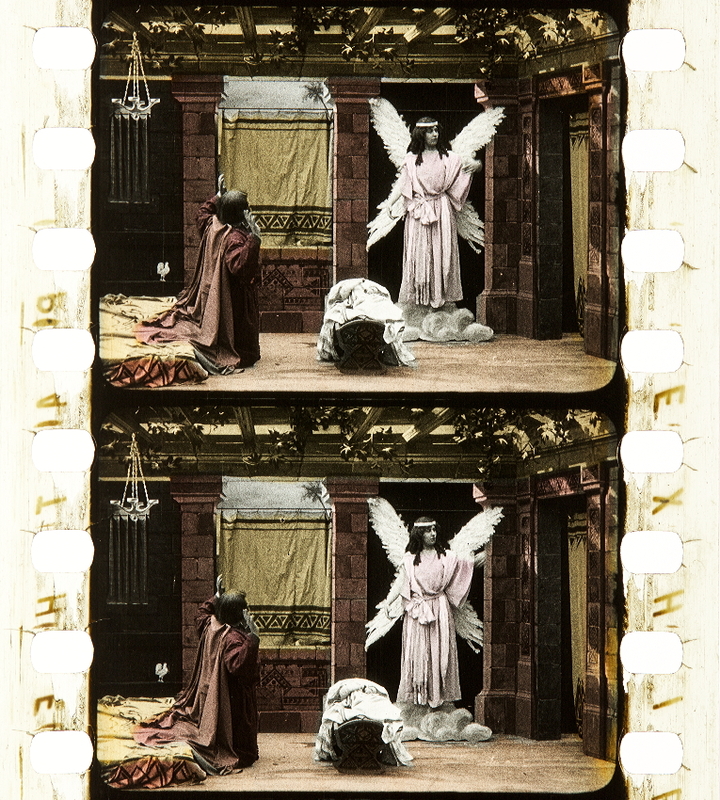 Photographs of the tinted, toned and stencil colored nitrate film by Barbara Flueckiger. “If one looks more closely at the main title in (Ill.TS.7) there is some small writing consisting of a four-figured number followed by the letters ‘AN’. A number in this form seems to have been normal throughout 1907. I have not seen enough films of 1908 to make a statement about that year. At the beginning of 1909 the form changed to letters ‘ANL’ followed by a four-figured number (Ill.TS.9). This form continued throughout 1910 and 1911. Concerning the meaning of the letters; I take ‘AN’ to be the first letters of the French word for ‘English’ i.e. ‘ANglais’. The significance of the ‘L’ I do not understand, but it may be for ‘Londres’ (London) to distinguish from a differently spelled version for other English-speaking areas; (e.g. U.S.A.). On the German language copies which I have seen, the letters are ‘AL’, presumably for ‘ALlemande’. Some have also the letter ‘B’, perhaps for ‘Berlin’. On Dutch language copies it is ‘NL’. After the main title, one counts all the scenes, inter-titles and letters in a single series through the film. The inter-titles have their numbers in large white printed figures in the black patch. Letters have their numbers written in black figures in the same position in the clear margin, (Ill.TS.16). Picture scenes are not marked. Early in 1912 the small four-figure number and its associated letters disappear from the bottom left-hand corner of the inter-titles and appear on the black margin patch, but twisted round sideways (Ill.TS.15). This figure has the form ‘AN 3820’ then a small space and a figure ‘3’. This last figure indicates that this is the third inter-title in the film. These numbers are not always as clear as in this example, and the single figure is sometimes cut off by the perforations, so it is worth looking at all the inter-titles. “There is some evidence of date to be derived from the form of Gaumont’s original titles. On the main titles of their films up to and including 1907, there appeared the name “ELGE” derived from the initial letters of the name “Leon Gaumont”. Before 1907 this trade mark appeared within a circular floral border (Ill.TS.6). During 1907 there was no floral border (Ill.TS.7). In the all-too-frequent event that the main title is missing; the name may also be found on inter-titles (Ill.TS.8). From 1909 through to the middle of 1910 the form of name on the titles was “Gaumont”, (Ill.TS.9). Later in 1910 the name “Gaumont” on the main titles was enclosed in the floral border. (Ill.TS.11) which form continued through 1913. 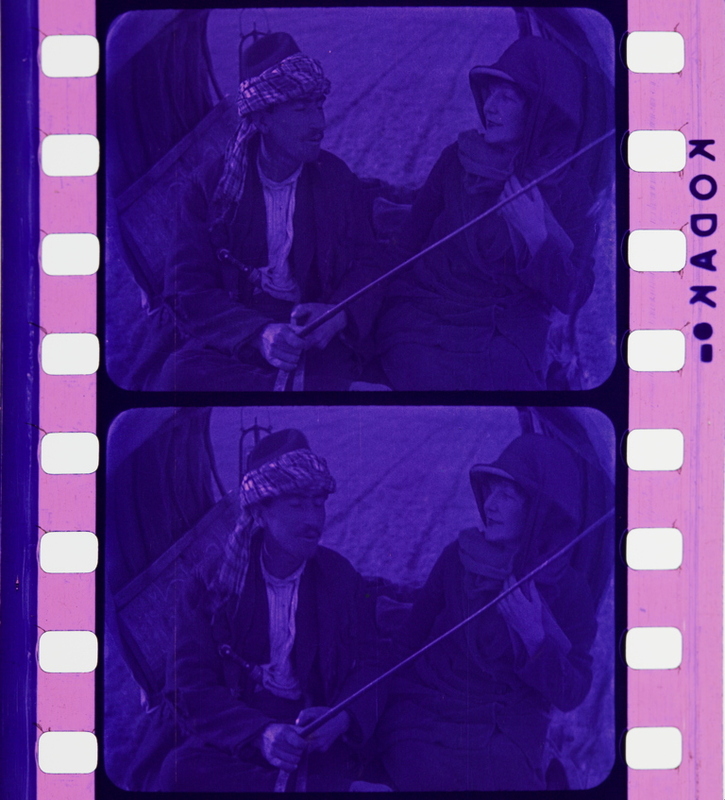 Until 1910, with few exceptions, the titles of the films were tinted Blue. Throughout 1910 the titles were tinted Amber. 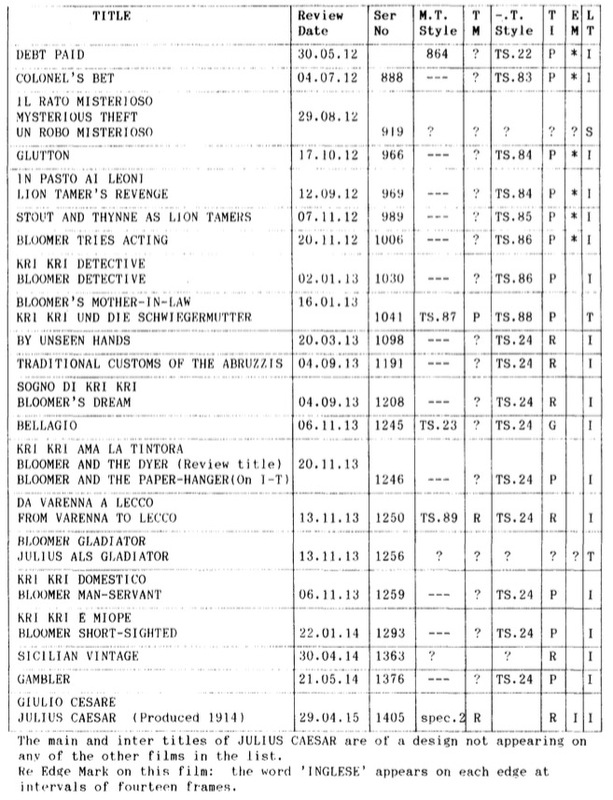 From the latter part of 1910 the form of trade mark on the inter-titles was the letter ‘G’ in floral border (Ill.TS.12). From 1910 onwards the form of trade mark on the titles remained as in 1910 but they were tinted Green. Gaumont included their name in some form in some of their films from 1907 right through 1913. The form of the mark was changed from time to time. “The four-figured number, whether on the screen area or on the black margin patch, is a production serial number. The list of “Gaumont Films 1906 – 1914” is arranged in order of this serial number. It will be seen that this also proves to be the date order of the films. (There is one exception: Inundations in France, number 2656 appears earlier than its number suggests. I attribute this to its being a subject of topical interest; so that it was sent out more quickly than normal.) Thus by noting the serial number on the title of any unknown Gaumont film of the period, and referring to the list, it is possible to establish its date with a fair degree of accuracy. The following list, with the explanation of the abbreviations used, sets out the features described above in respect of the films examined. The original French title is given first when known; then the English title when known; then any other language title. This is the date of the first known mention in the British trade press, in the order ‘day’, ‘month’, ‘year’. Most are from the Bioscope. Those which do not give a day, are from a monthly publication. Trade Mark on Main Title. When the main title is missing from the copy the title is enclosed in brackets ‘[ ]’. The film has no inter-titles, or no original Gaumont ones. 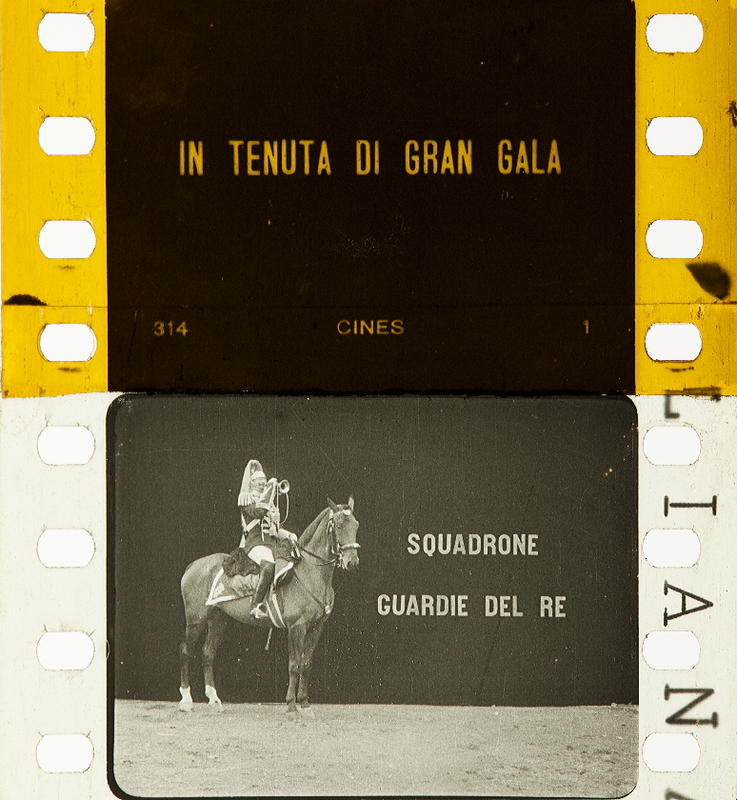 ‘GAU’ = The name ‘Gaumont’ appears in full. ‘G’ = Only the initial letter ‘G’ appears. ‘F’ = The trade mark has the floral border. Tint of the Main and Inter-titles. An asterisk ‘*’ is in this column when the serial number appears in the projected area of the titles. An asterisk ‘*’ is in this column when the titles have the black margin patch. A letter ‘L’ is in this column when a large white number appears in the black margin patch. A letter ‘s’ is in this column when the small serial number appears in the black margin patch. 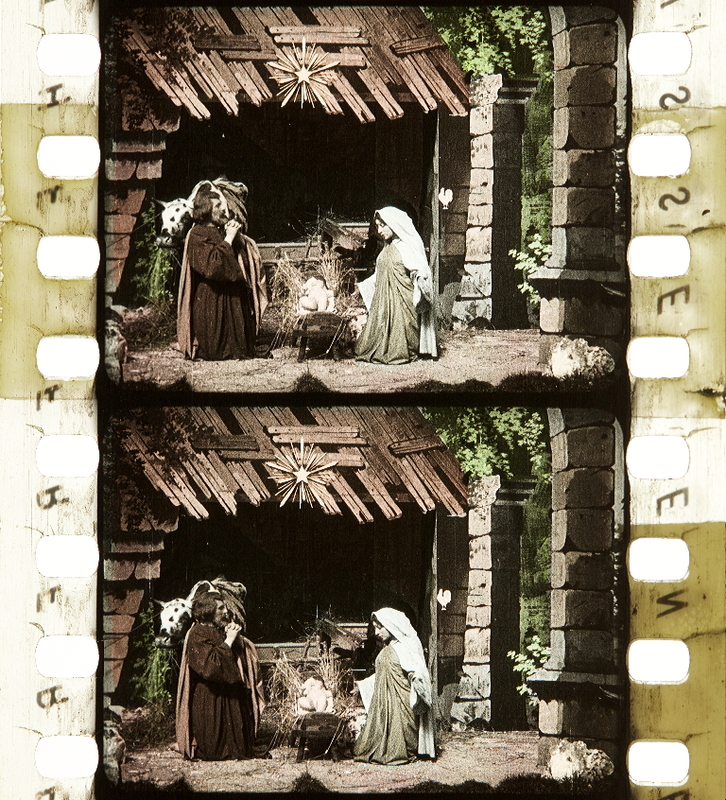 ‘N’ – when there is none in the film. ‘@’ – when the interim letter is placed sideways. ‘Y’ – when the interim character is similar to letter ‘Y’. ‘P’ – when the mark is on the edge of picture. ‘T’ – when the mark is on the edge of titles. ‘/’ – when only part of the copy has an edge mark. This detail is not known. In these cases I may have seen only a duplicate on which these details were obscured; or otherwise did not have sufficient access to determine them. (Ill.SM.8) is from a film of 1920 (Ill.SM.9) is from a film of 1921 (Ill.SM.10) is from a film of 1923. 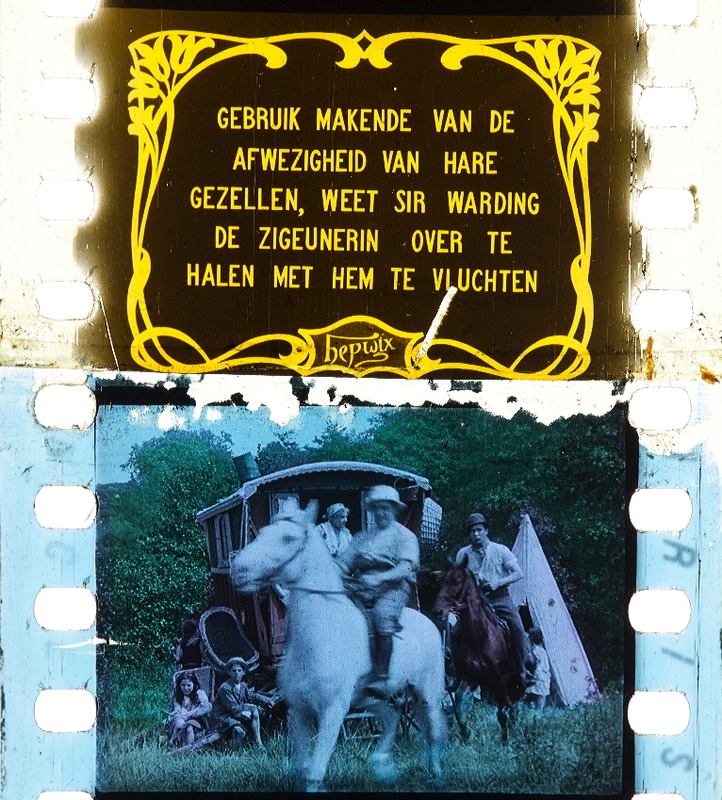 We have no specimen of film on Gevaert stock which is known to be 1922. The same mark as in (Ill.SM.10) continued in use through the 1930s. It may be observed that many of these specimens are on titles. 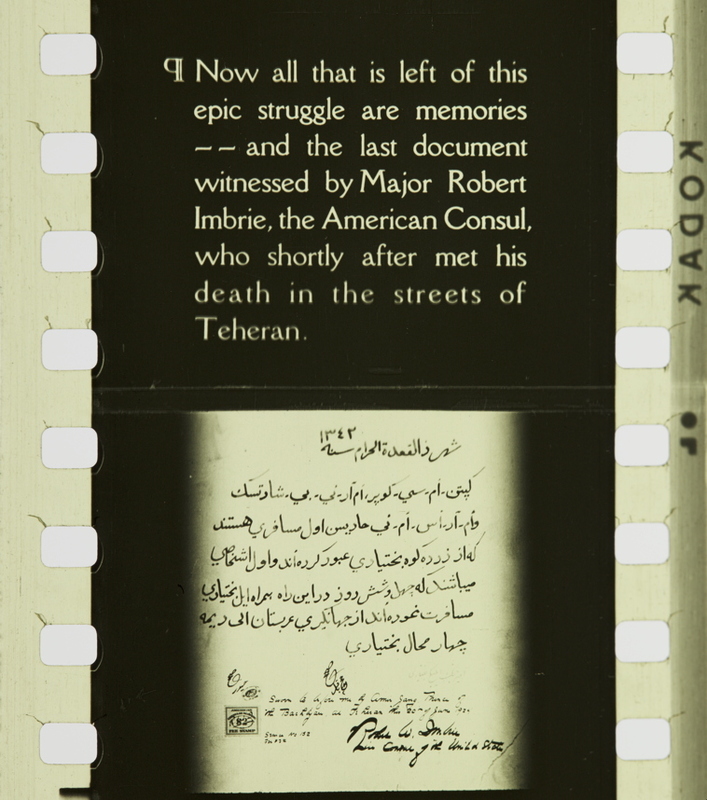 These titles all come from newsreels of events whose dates were easily ascertained quite precisely, so that we can accurately date the film, and relate the edge marks to the dates. [Gaumont Woche] . Credit: Lichtspiel Kinemathek Bern. 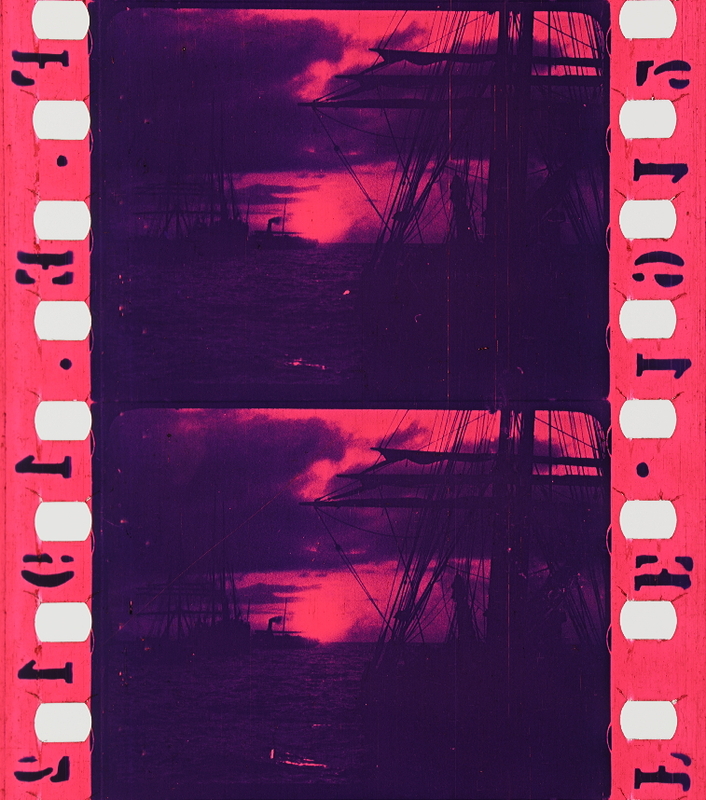 Photographs of the tinted nitrate print by Barbara Flueckiger. The same observation applies as to ‘Lignose’ above. “Hepworth’s [Ill.FC.20] early prints were very similar to those of Warwick [Ill.FC.19] of the same time, (Ill.FC.19/20). In his earliest films he cut the ends of his negatives in a concave curve. the image of this can be seen in complete prints. (Ill.V.l). When he began to make films which were not just ail one continuous shot, he sometimes placed a few black frames between shots. 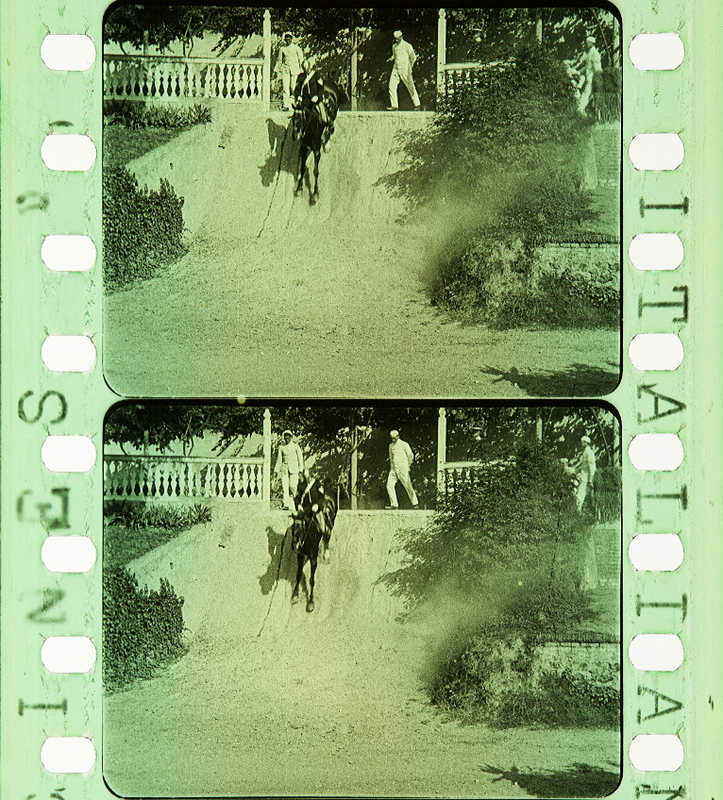 Later, about 1907, some of his films have a black spot over the join between scenes, (Ill.V.2). This was made by punching a hole in the negative. “Several producers printed numbers on their inter-titles indicating the order of the titles. Hepworth had his own peculiar numbering system of a mark, somewhat in the manner of Roman numerals, incorporated into the top of the decorative border of the title. This consisted of dots dashes crosses and loops; a dot being ‘1’; a dash representing ‘5’; a cross is 15 and a loop counting 20. 1907 – 1908 (Ill.TS.1) Main title, and (Ill.TS.2) inter-title. These are tinted green. 1909 (Ill.TS.3) Note that this is an inter-title and uses all capital letters. This is tinted pink. 1910 – 1912 (Ill.TS.4) Note that the name in the bottom of the decorative border is ‘Hepwix’. This is tinted amber. 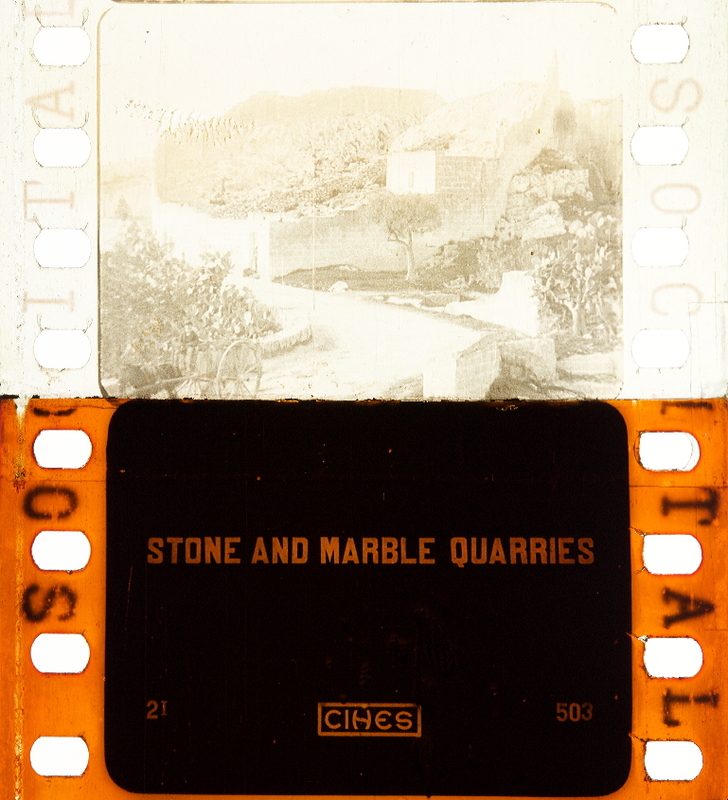 “It has for many years been the custom of film stock manufacturers to photographically print their names and sometimes other marks in the margins of their films. Note that these marks are sometimes very faint and need to be looked for. The illustrations all show good clear examples. The practice appears to have commenced in 1913 with the Eastman Kodak Company, who then printed the word ‘EASTMAN’ in large “stencilled” letters on one margin (Ill.SM.l). This style was continued until about the middle of 1914 when the lettering was changed to a smaller style, and a dash was included 2 or 3 frames from the name (Ill.SM.2). This continued throughout 1915. In the early part of 1916 the films had two small dots in place of the dash. (Ill.SM.3). During 1916 the Eastman Kodak Company began a systematic series of year symbols on their stocks made in Rochester, U.S.A. Although this system continues far past the period broadly covered by this paper, I feel that it will be useful to include the information here. A comparable series was begun in 1917 on stock made at Harrow in the United Kingdom. Stock made by Kodak in Canada from 1925 onward used another similar series of marks. This information was conveyed by Kodak to the National Film Archive in the late 1940’s, originally confidentially, but was subsequently released. The whole scheme is set out at the end of this section. No such marks were put on the stocks made by Kodak in France and Germany during the 1930s. French stock was just marked “Kodak France” and German stock “Kodak A G”. 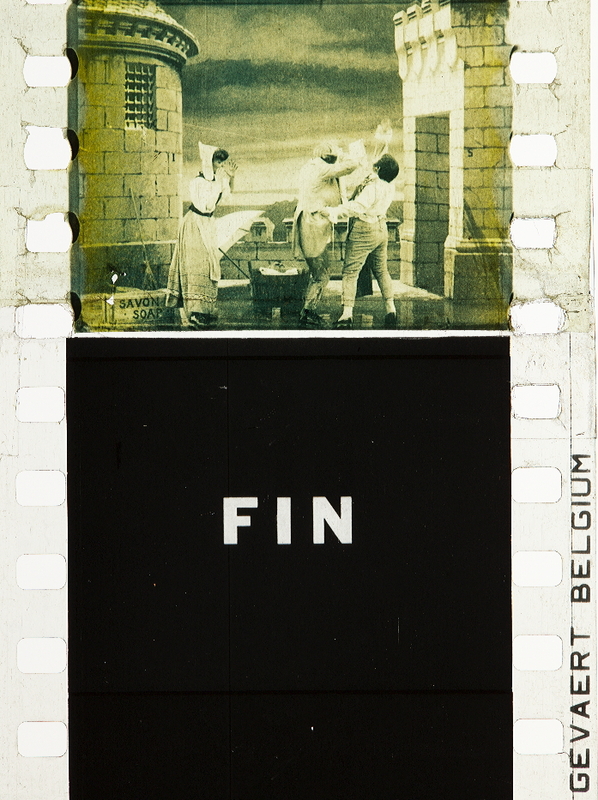 In 1927 Kodak took control of the Pathé film stock factory in France. Thereafter, the Pathé stock was still marked with the name ‘Pathé’, but the Kodak U.K. symbols may be found on it. 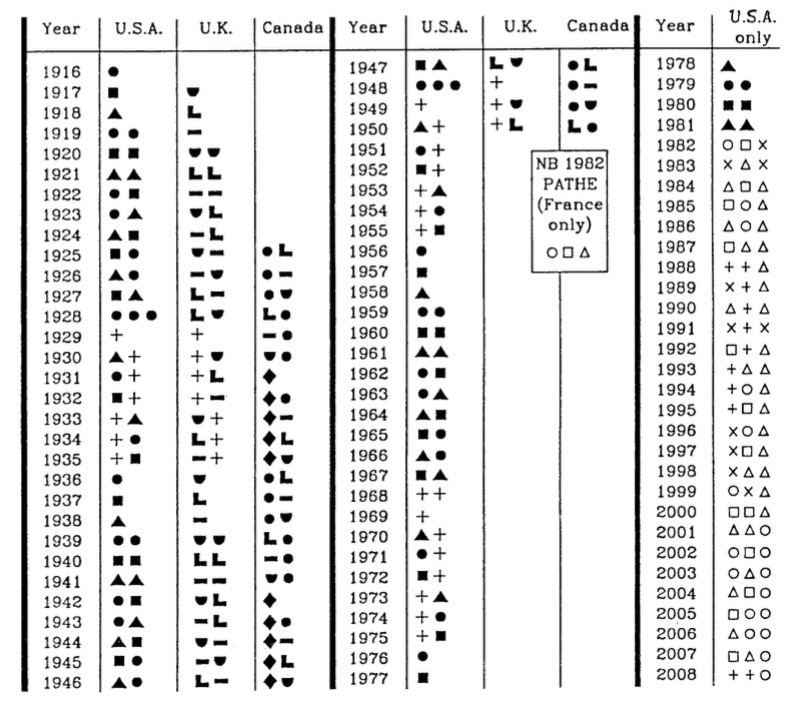 It may be noted that the U.S.A. system of symbols repeats every 20 years; the U.K. system repeats every 19 years, and the Canadian every 11 years. I find it convenient to call the symbols by names. In reading the symbols, take caution in connection with the ‘Cross’. Note that the symbols indicate the year of manufacture of the stock, which is not necessarily the year in which it was exposed and developed. Thus it is possible for stock to pre-date or post-date an event recorded on it. 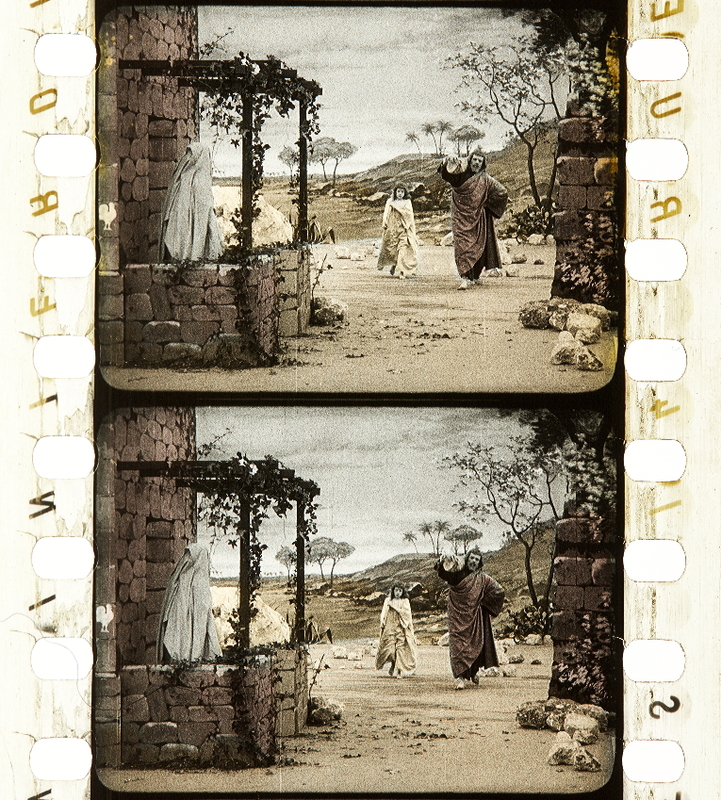 The symbols are photographically printed onto the stock, and on negative and positive stocks appear as ‘black’ characters on a ‘clear’ background on the film on which they are originally printed. They can then, of course, be copied onto another film where they will appear as ‘clear’ on a ‘black’ background, and can be copied yet again onto a third film with a further reversing of the ‘black’ and ‘clear’ to the manner of the original. One needs to be aware of the possibility of being deceived by this, since one may thus find the symbol of an earlier year copied onto stock of a later year. and placed between the words ‘Eastman’ and ‘safety’ instead of after the word ‘film’. From 1982 Kodak introduced a new system of symbols consisting of three characters for each year, and incorporating a new character ‘X’. This scheme is planned up to the year 2021. In this new scheme the characters are sometimes ‘solid’ and sometimes ‘open’. The Lumières themselves, as well as supplying prints with their own type of perforations, also supplied prints with Edison type perforations (Ill.FC.17). 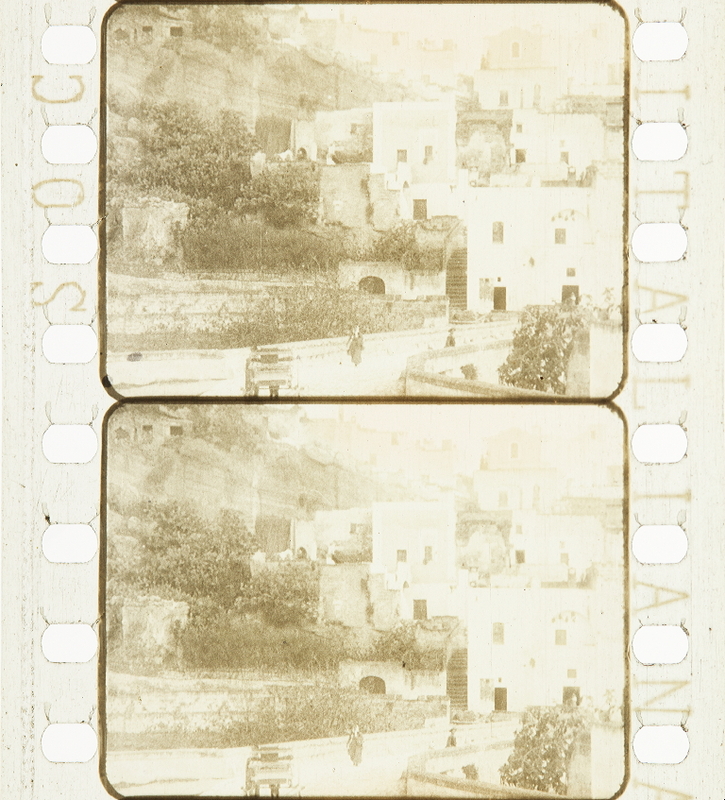 Here the image of part of the perforation of the negative can be seen on the left between the bottom two perforations of the frame. 1. The picture itself, by reason of the camera aperture, has round corners. 2. The printer aperture also had round corners. 3. There is a black line between frames. Most of the Lumières’ prints were like this, but some had a clear space between frames (Ill.FC.18). Another feature of all the Lumière prints, was that they have become discoloured to a deep amber shade; not to be confused with amber tinting. 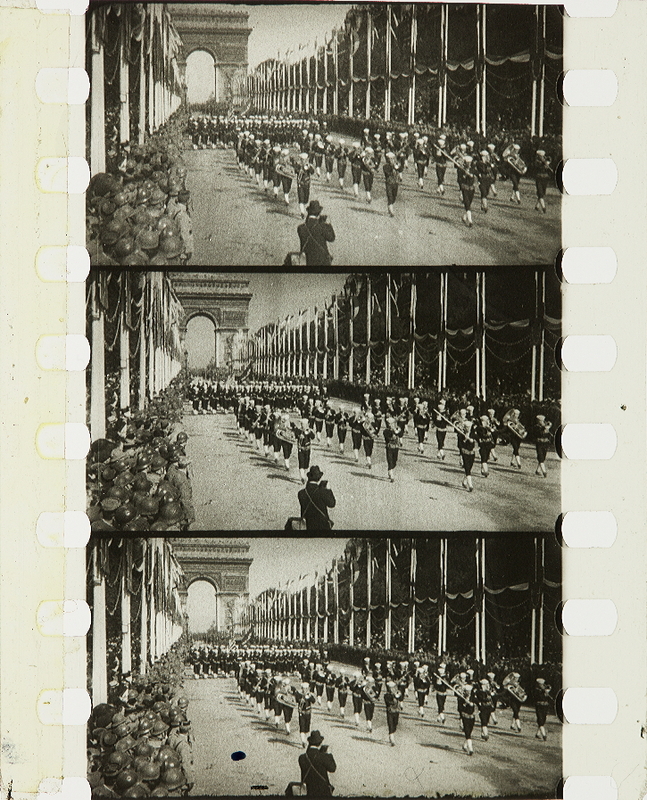 “During the earliest years of cinema, some film makers had other variations of perforation which were peculiar to themselves. ‘Méliès Star’ in rectangle, (Ill.EP.4). Méliès had another useful practice. Starting during 1896, he embossed his catalogue number on the fronts of his films (Ill.EP.7), in this case No.147. (Visite Sous-Marine du “Maine”) At that time film stock was manufactured in lengths of about 20 metres (65 feet). Méliès gave a separate number to each 20-metre length, so that a film 40 metres long had two consecutive numbers. (Ill.EP.8), In this case Nos. 309/310 (Nouvelles Luttes Extravagantes) He continued this practice even when he was making films which ran to 300 metres or more. 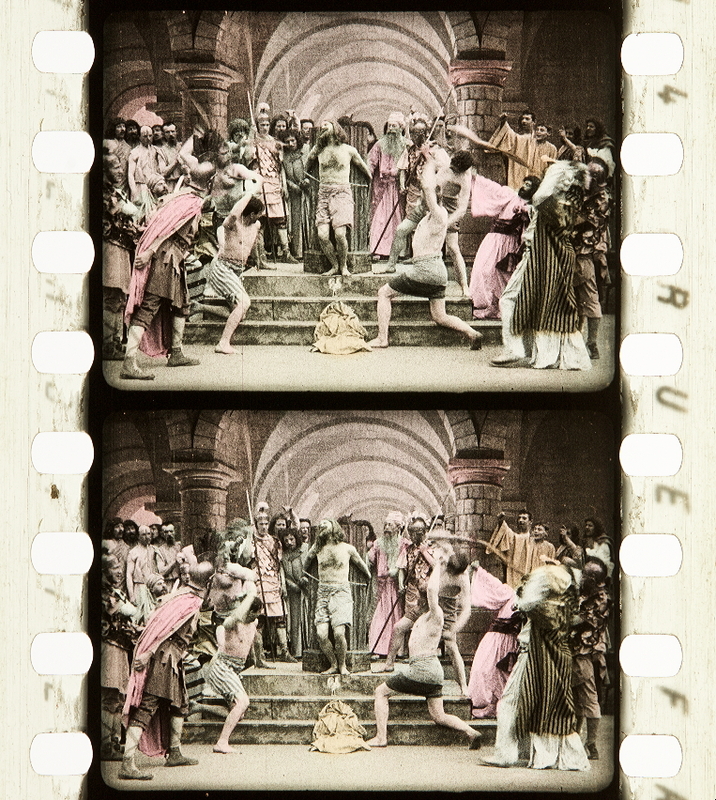 Reference from these numbers to Méliès’ own catalogues, or to Sight and Sound – Index series No.11 – An Index to the Creative Work of Georges Méliès 1896-1912, or to Essai de Reconstitution du Catalogue de la Star-Film of the Service des Archives, Bois d’Arcy, France; will help to provide identification of the film. In one early specimen which the N.F.A. has, the numbers are scratched on, not embossed, (Ill.EP.9). Whether this represents his early practice before he had the means of embossing, (which may be so, although some other films of about the same time are left blank), or whether it was just an odd exception, I feel it would be rash to assume without the evidence of more cases. There is also a second set of numbers, on both the scratched and embossed specimens: the significance of which I do not know. See (Ill.EP.7/8/9). In the cases where there are two or more catalogue numbers, there is also the same number of consecutive unknown numbers. I do feel confident that these numbers were put on this film by Méliès, and not by someone else later, because of the presence of the second numbers. (Ill.FC.1). This was made on a continuous printer, It can be seen that there is no black line between the frames; the corners of the picture are sharp square; the printing slit has extended over the perforations, so that there is a black band on the left and the right of the picture. The black band on the left is wider than the one on the right. The frame-line is at the bottom of the space between the perforations. 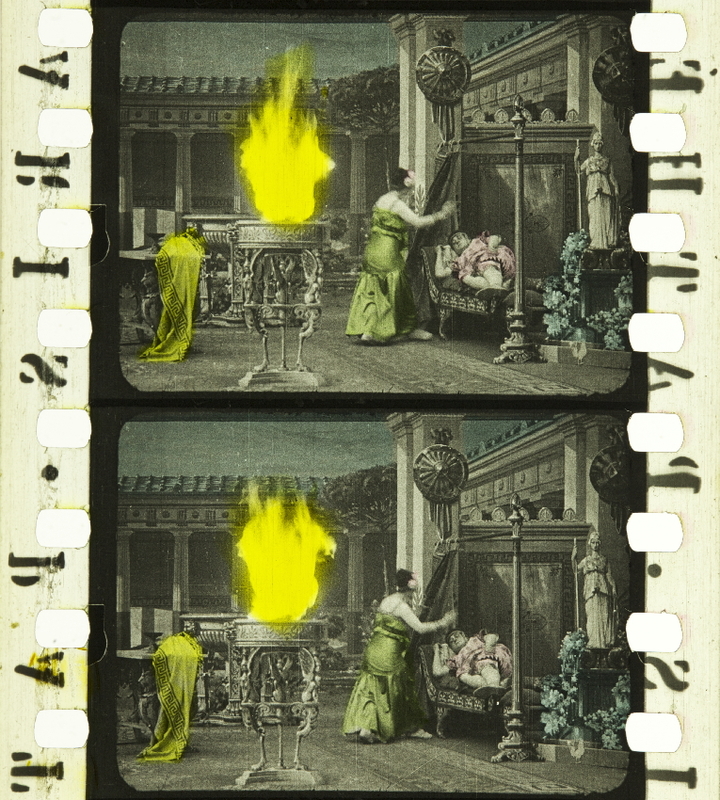 These features are characteristic of all the seven original Méliès prints in the National Film Archive produced up to about the middle of 1897. (Ill.FC.2). 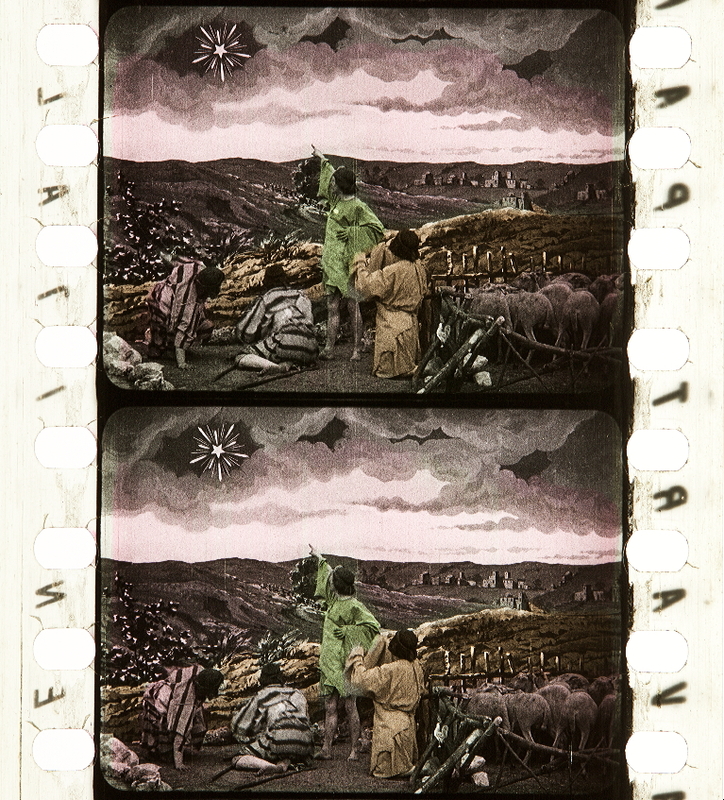 This is another Méliès print but in this case made on a step printer. In this case the height of the printer aperture was small and has thus left a clear space between the frames. It was narrow, and has thus created a clear space to left and right of the picture. The corners were deeply rounded, which has also left clear round corners. This appearance is found on Méliès films from about mid-1897 through 1901. (Ill.FC.3). 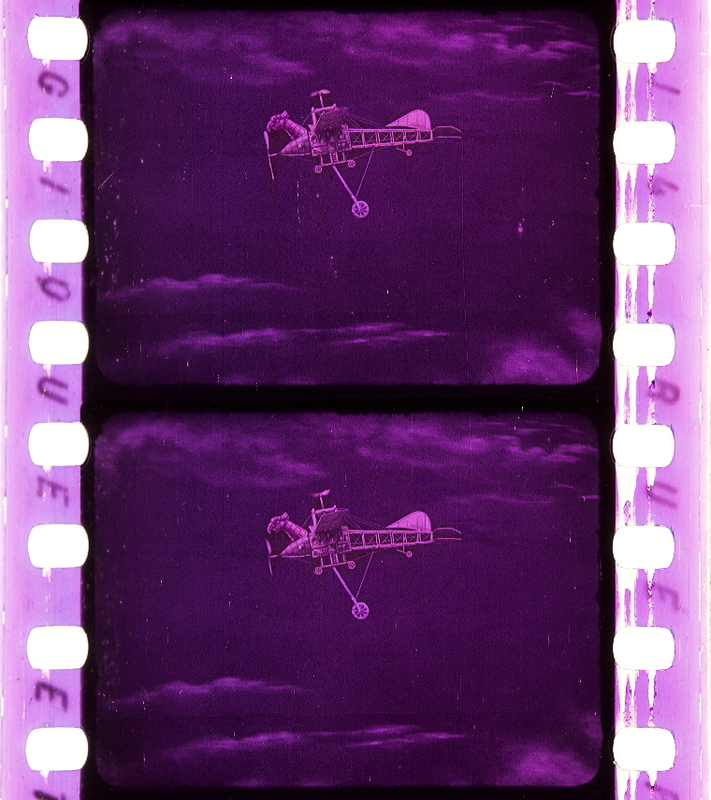 Another Méliès, printed on a step printer. Observe that in this one there is also a clear space between frames, but the corners of the picture are not deeply rounded but are nearly sharp square. Also the picture extends the whole way between the two rows of perforations. 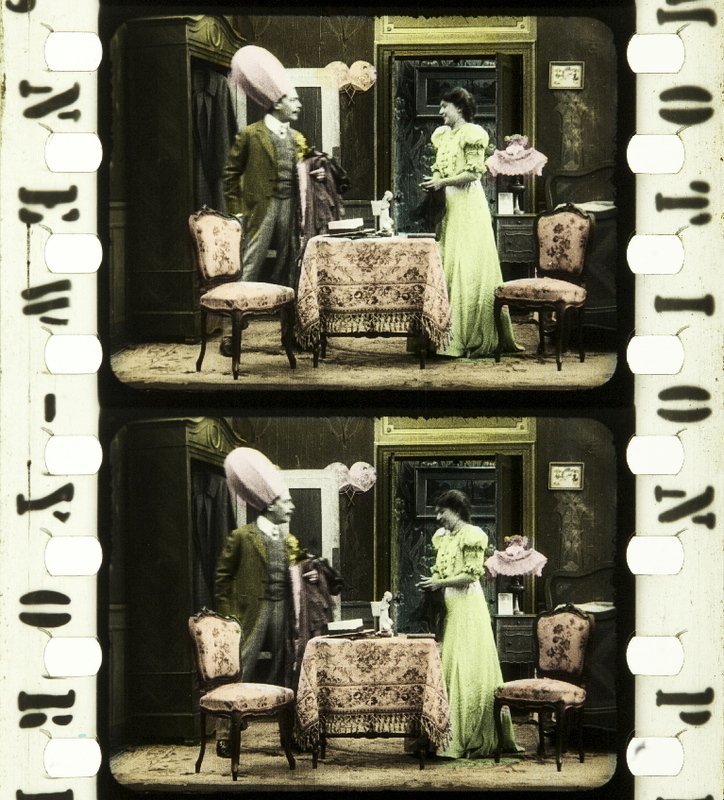 The original Méliès prints which the N.F.A. has of 1902 through 1904 are all like this. Richard Wagner (DE 1913, Carl Froelich). 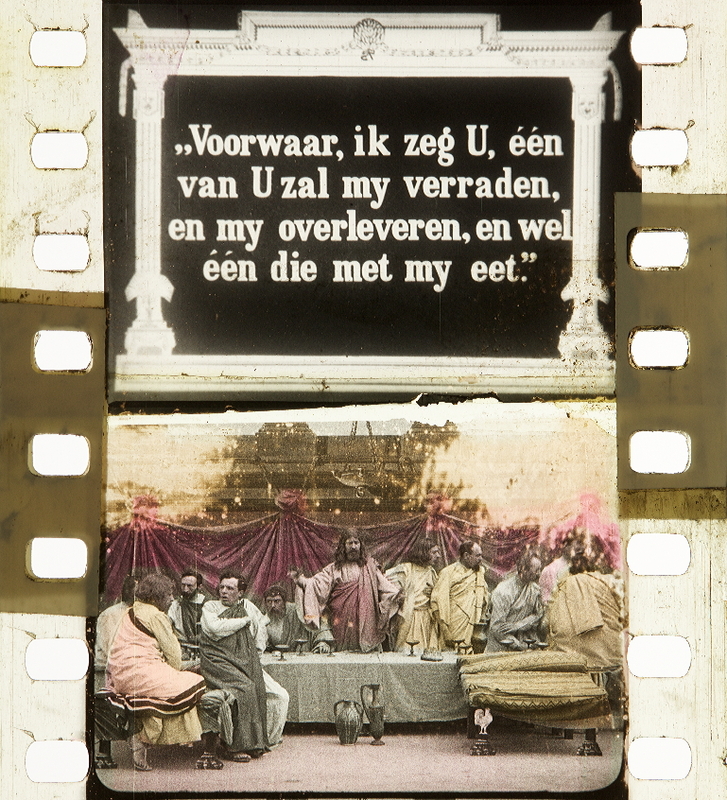 Credit: EYE Film Institute Amsterdam. Photograph by Barbara Flueckiger. Ma fille n‘épousera qu‘un médium. English title: Medium Wanted as Son-in-law (FRA 1909). Credit: Library of Congress. 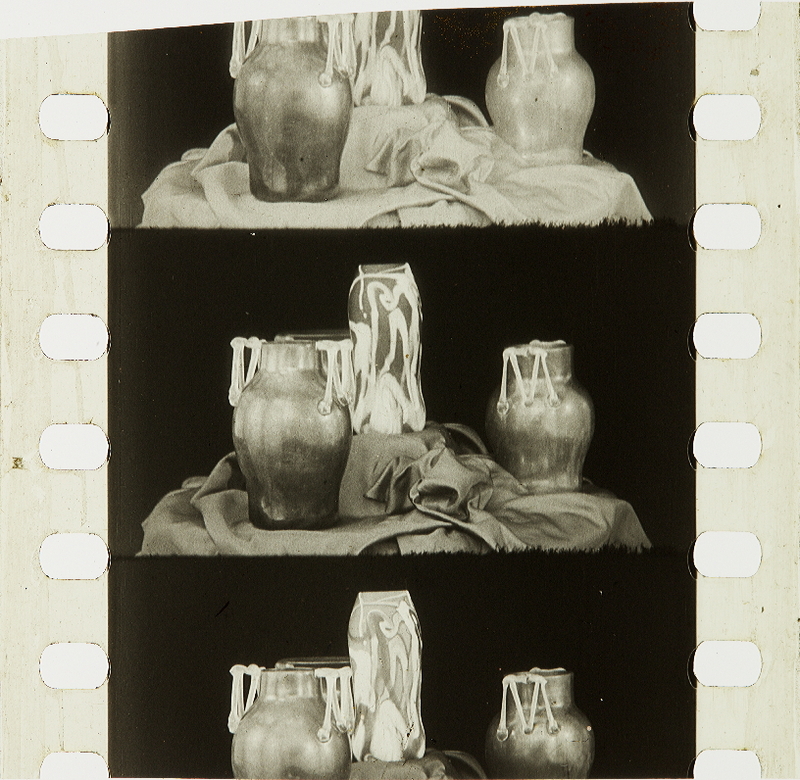 Photograph of the nitrate prints by Barbara Flueckiger. 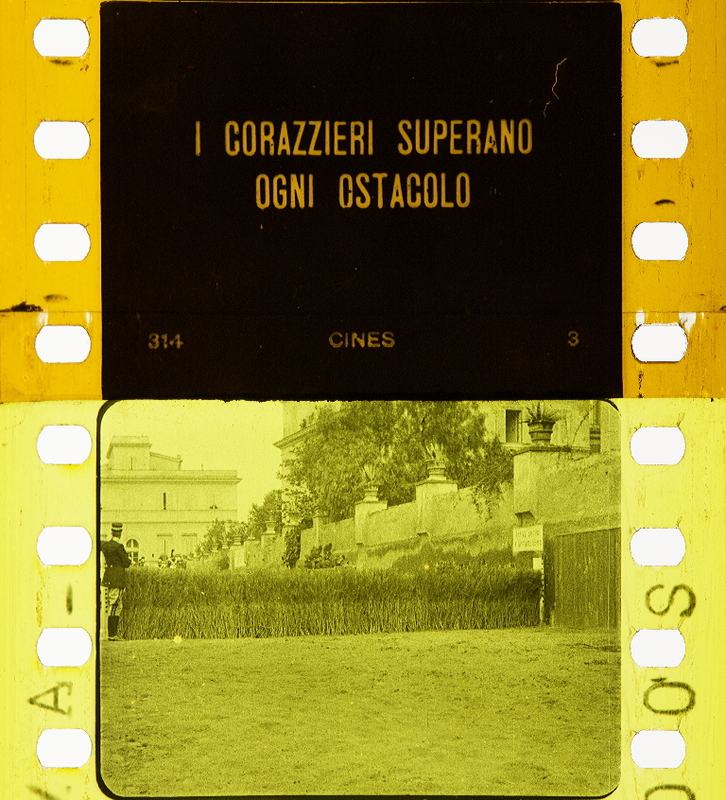 “The titles of some but not all the Pasquali films have a production serial number which, by relating these to the known dates of some films, can aid in dating others. However, in the case of Pasquali, the numbers do not run straight through all the productions of all kinds; but there are separate series of numbers for different groups of films. 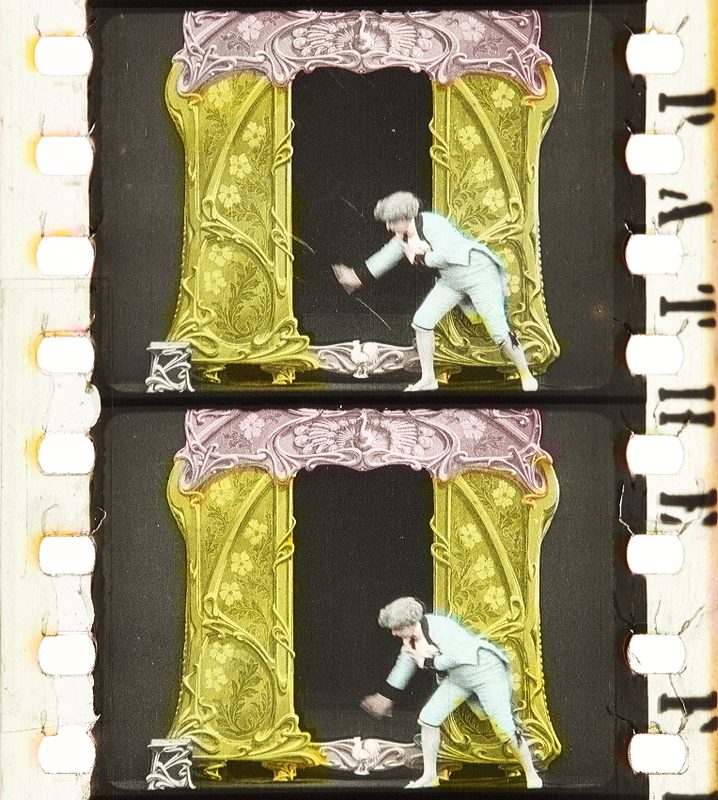 Thus, the comedy films of the actor Ferdinand Guillaume, in his role of ‘Polidor’, have their own number series, (see the associated list of ‘PASQUALI POLIDOR FILMS’). 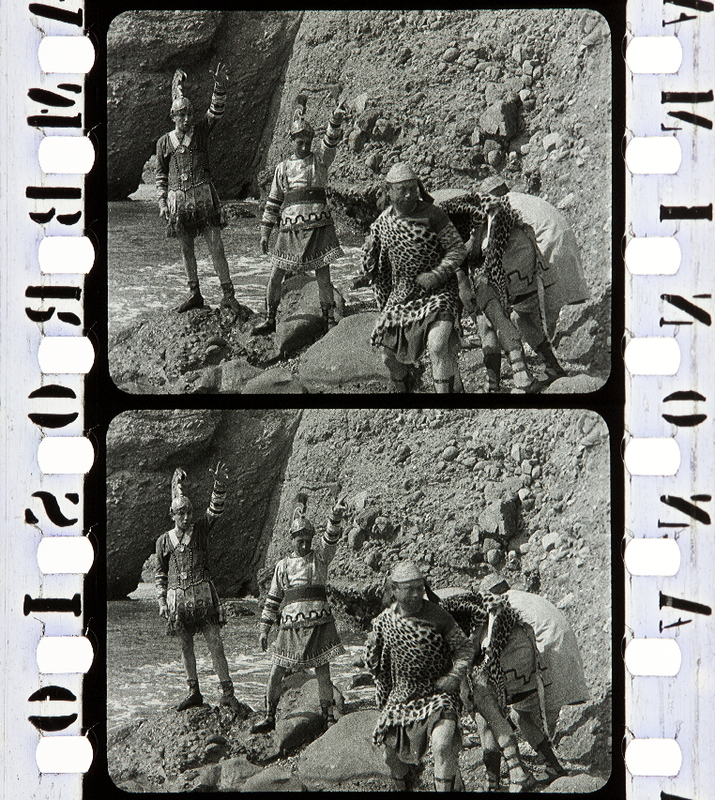 The travel films, of which the Archive has seven, also have their own series of numbers. (see the list of ‘PASQUALI TRAVEL FILMS’). Of the few other Pasquali films in the Archive only three have serial numbers, and we have a review date for only one of these. 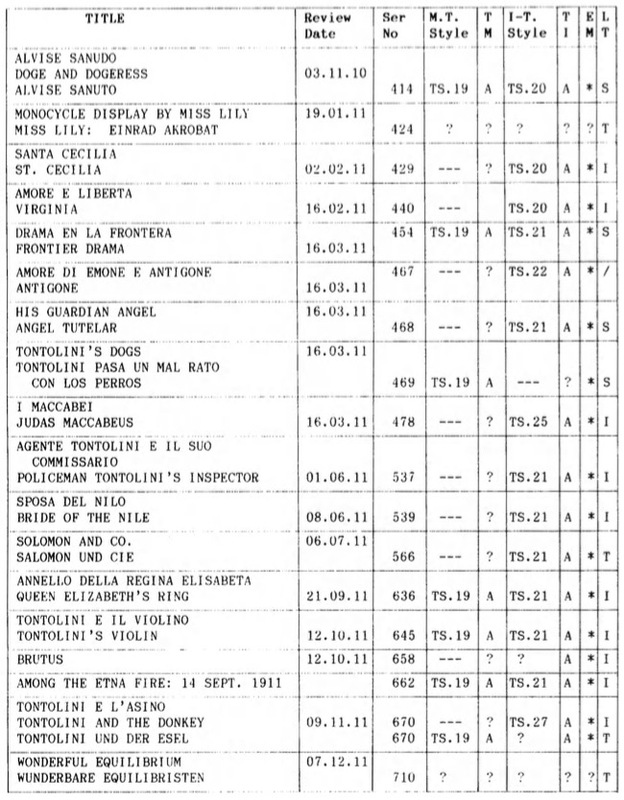 (See the associated list titled PASQUALI GENERAL). This is far too small a number of films to be of much value. 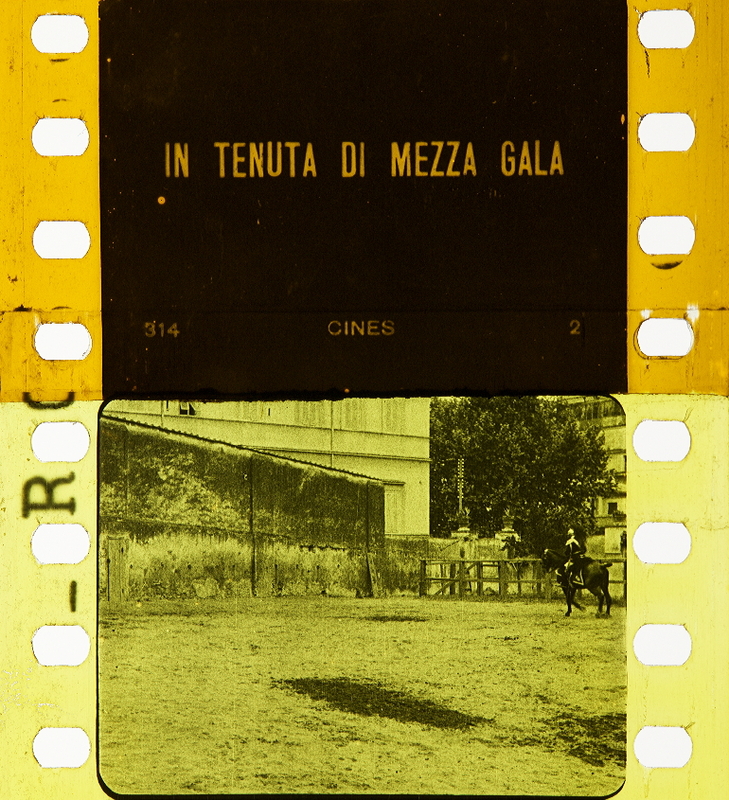 This may be an opportunity for anyone who has any numbered Pasquali films, of which they know the date, to convey the information to FIAF. 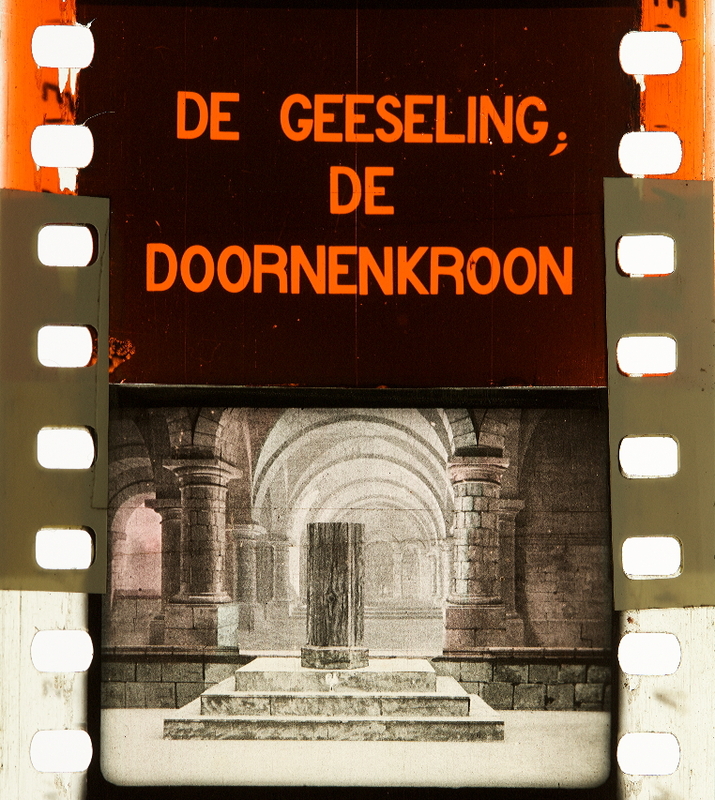 The Archive has just 5 Polidor films. Their titles, the serial numbers given on their titles, and the dates of review in the Bioscope are given in the list below. 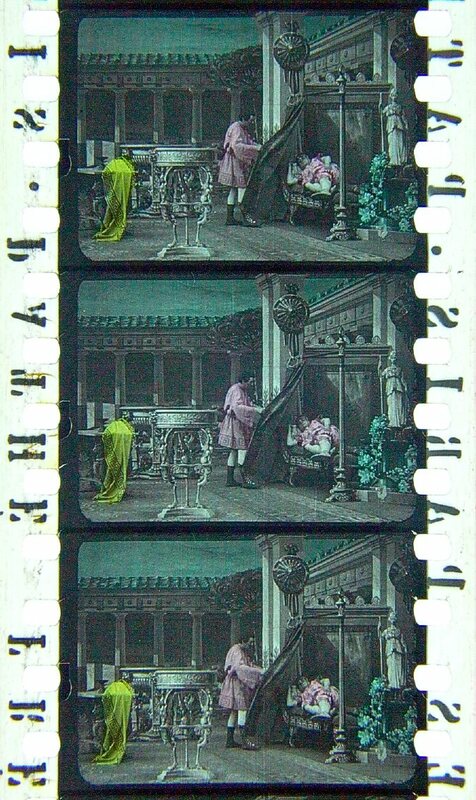 Comparing the intervals between the serial numbers, and the intervals between the dates of the reviews, it will be seen that these Polidor films were issued at the rate of approximately one each week. It will be seen that number 72 in the list below is recognised as a Polidor film but it has no title. We can discover its approximate date by reference to its serial number and the dates of review of the adjacent numbered films. Working at weekly intervals forward from number 49 would make number 72 come on 22 August 1912. Working back from number 85 would make it come on 1 August 1912. So we can confidently expect to find the issue of number 72 between these two dates. However, I have not found any Polidor film mentioned in the Bioscope in that period. Minor films were not always included in the reviews or lists. Does anyone else have access to any other publication which may refer to this? In the list below, the original Italian title is stated first, followed by the English title. 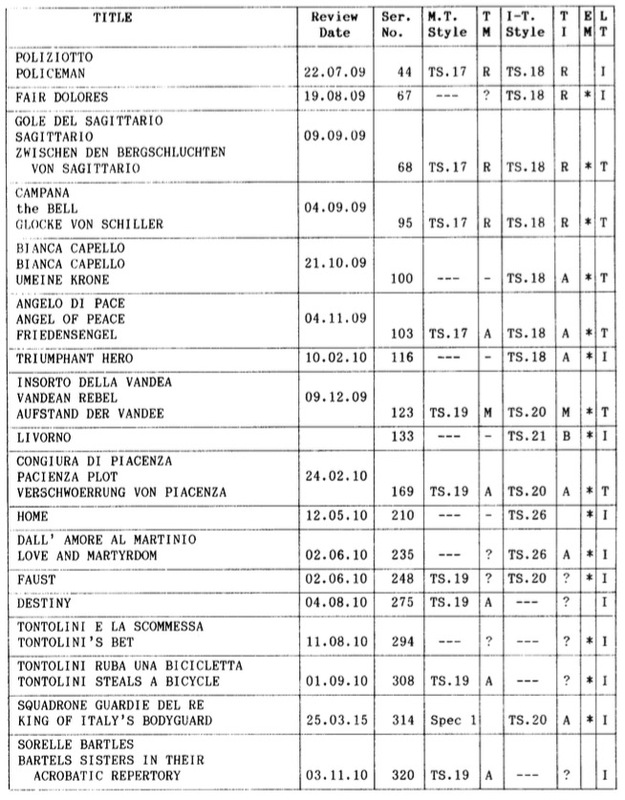 In the list below, the Italian title, when known, is given first, followed by the English title, and then, in some cases, the German title which is on the film in those cases. The approximate dates of other numbered members of the series may be discovered by interpolation, and possibly by extrapolation. 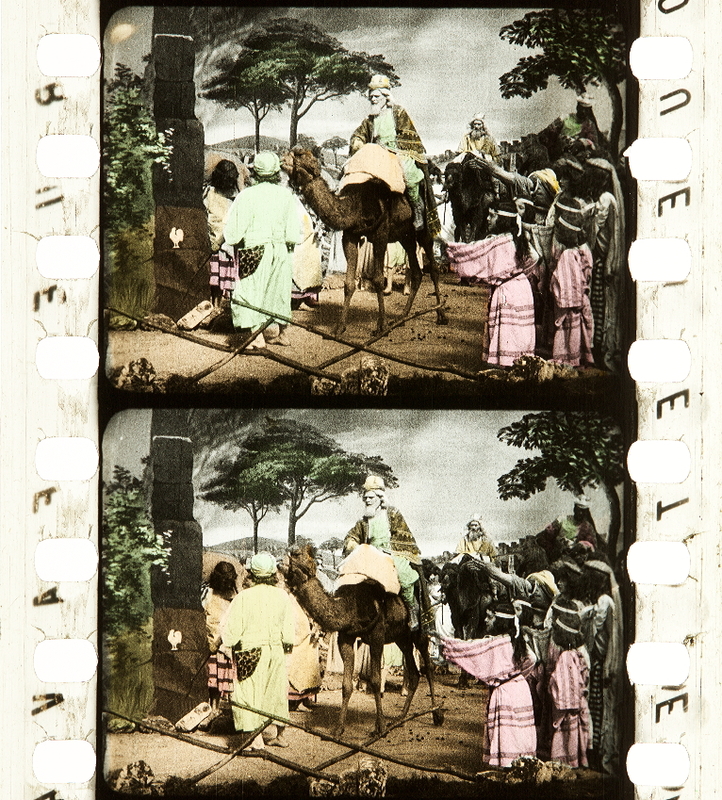 In 1905 Pathé started to print “PATHE FRERES PARIS 1905” in both margins (Ill.PM.3). 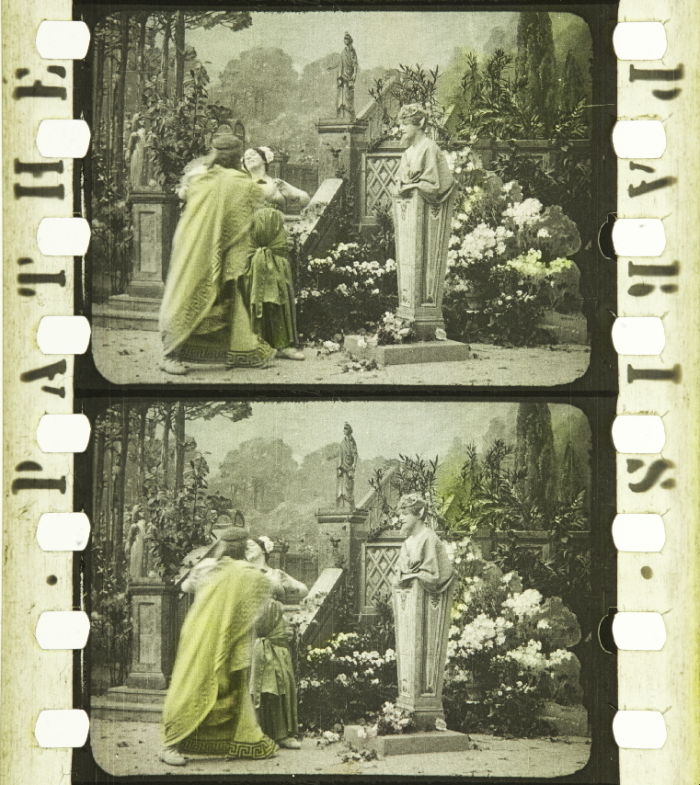 The date 1905 was subsequently omitted, presumably at the end of that year, and the mark continued in the form “PATHE FRERES PARIS” on both edges until about April 1907. 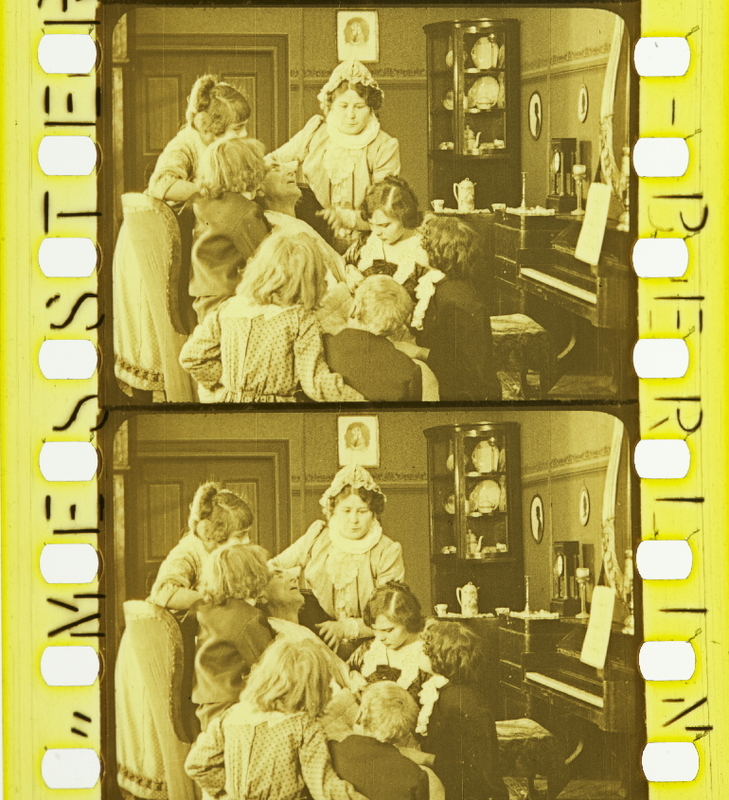 Note that on some films of 1906 there is a gap between each printing of PATHE FRERES PARIS, in the position where the year ‘1905’ had been, (Ill.PM.32). On other films there is no such gap (Ill.PM.33). It seems likely that the ones with the gap are from the beginning of 1906, and that later the gap was closed. From April 1907 until 1909 the mark was “PATHE FRERES” on one margin and the address “14 RUE FAVART PARIS” on the other (Ill.PM.4). From the beginning of 1909 onward the mark was, on one edge, “PATHE FRERES 14 RUE FAVART PARIS”, and on the other, “EXHIBITION INTERDITE EN FRANCE EN SUISSE ET EN BELGIQUE” (Ill.PM.5). Les petits vagabonds (FRA 1905, Lucien Nonguet). Credit: EYE Film Museum. 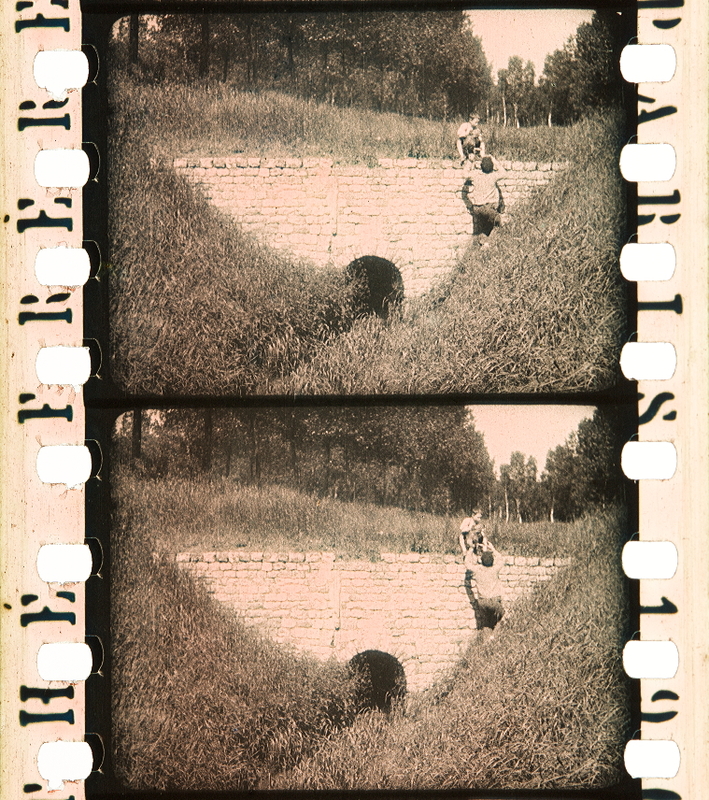 Photographs of the tinted and toned nitrate print by Olivia Kristina Stutz, ERC Advanced Grant FilmColors. Print no. 2 of Amour d’esclave (FRA 1907, Albert Capellani). Credit: Library of Congress. 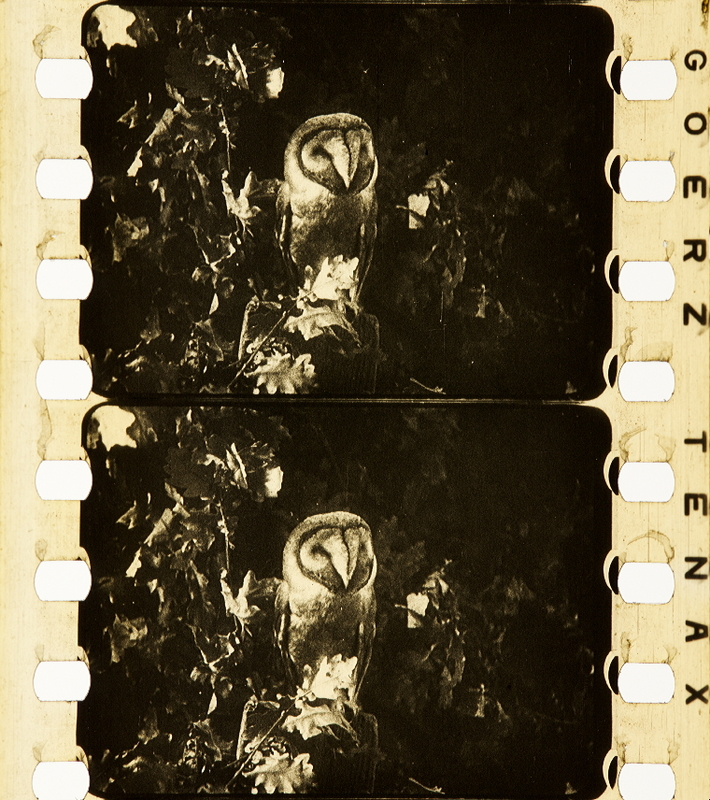 Photograph of the nitrate film print by Barbara Flueckiger. La Danse du diable (FRA 1904, Gaston Velle). 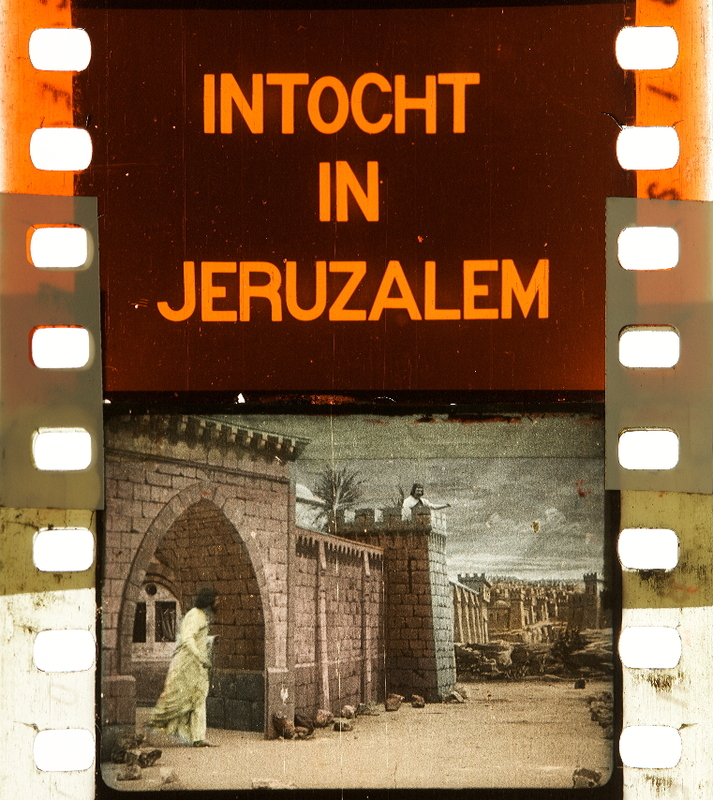 Credit: EYE Film Institute Amsterdam. Photograph by Barbara Flueckiger. [Franz-Josef-Land] Credit: Lichtspiel Kinemathek Bern. 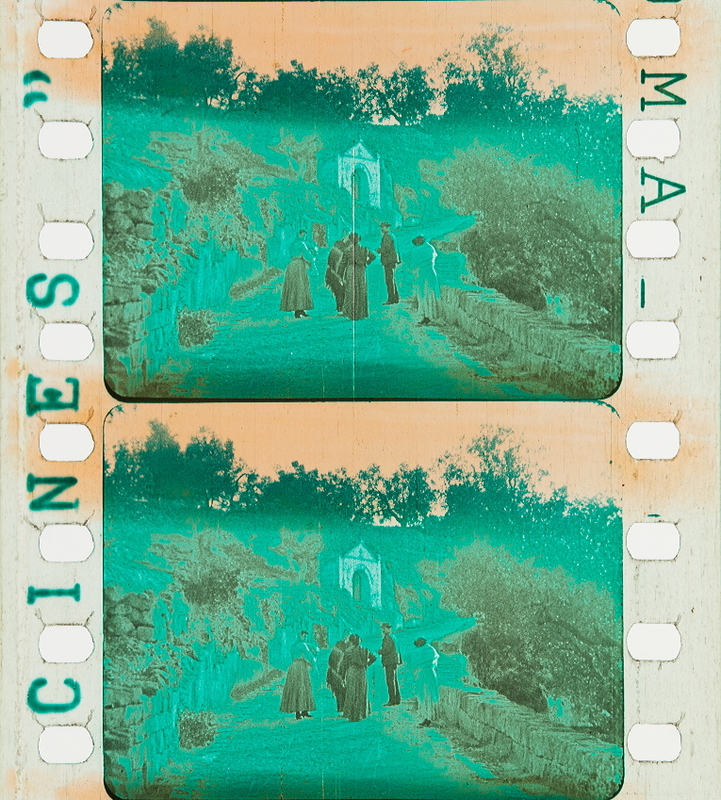 Photographs of the tinted and toned nitrate print by Noemi Daugaard, SNSF project Film Colors. Tinted samples from the Kodak Film Samples Collection at the National Science and Media Museum in Bradford. Credit: National Science and Media Museum Bradford. Photographs by Barbara Flueckiger in collaboration with Noemi Daugaard. Oiseaux sauvages des monts d’Ecosse (FRA 1914). Credit: Cineteca di Bologna. 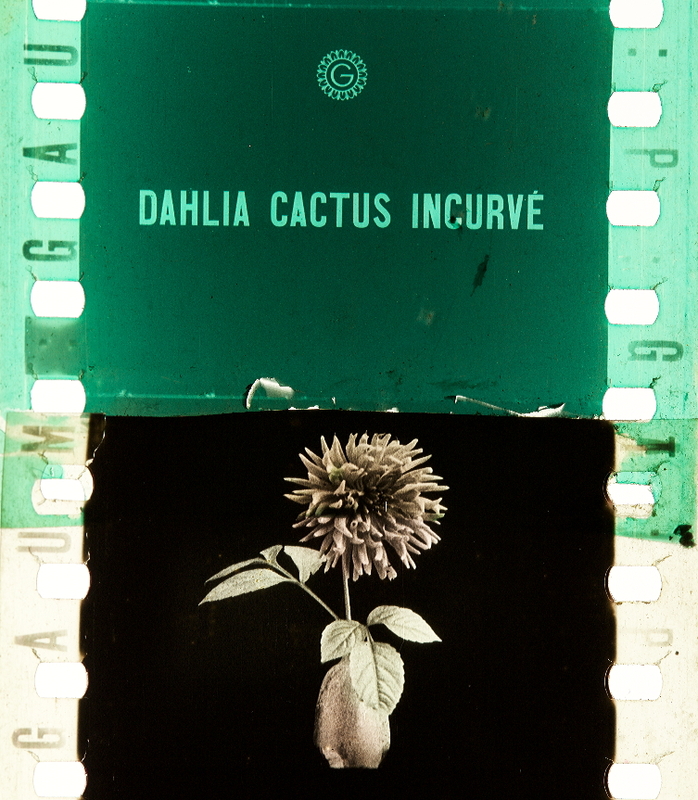 Photographs of the stencil colored nitrate print by Barbara Flueckiger. During at least part of the first world war and afterward until about 1921 Pathé printed the initials ‘P G’ (for Pathé Gazette) and a number, in the margins of some at least of their newsreels, (Ill.PM.31). They also printed, in similar style, the initals ‘P W’ in the margins of their weekly magazine (Pathé Weekly) during about the same period. 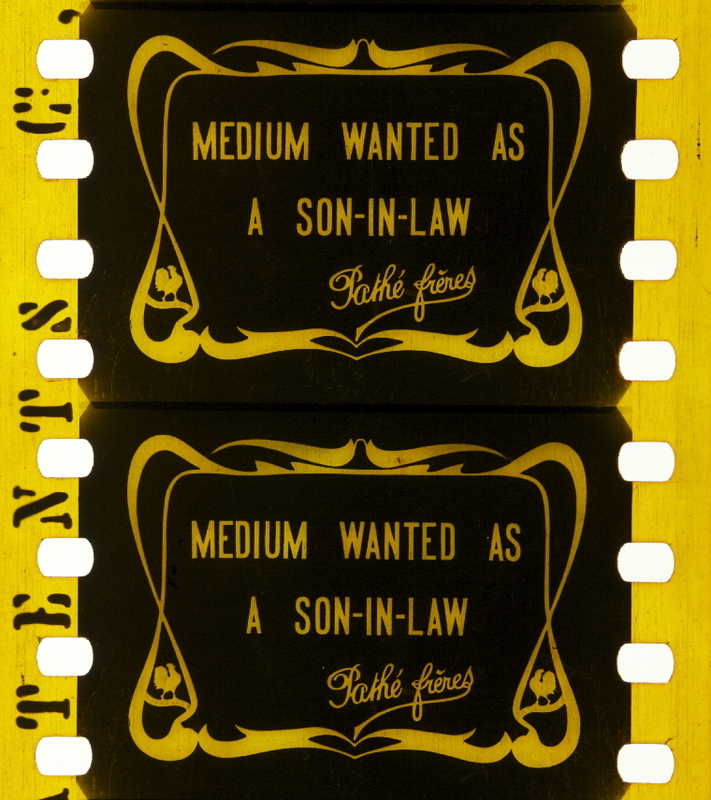 The same method [we used contemporary prints of newsreel items] has been applied to dating Pathe stock of the 1920s according to certain figures printed in the margin. The words ‘Pathé Cinema France’ or ‘Pathé Cinema Paris’ are followed by a 4-digit number and then by one or two smaller groups of numbers (Ill.SM.11). Also see (Ill.PM.34), which has this edge mark faintly and reading from the base side. The above numbers are applicable to positives. 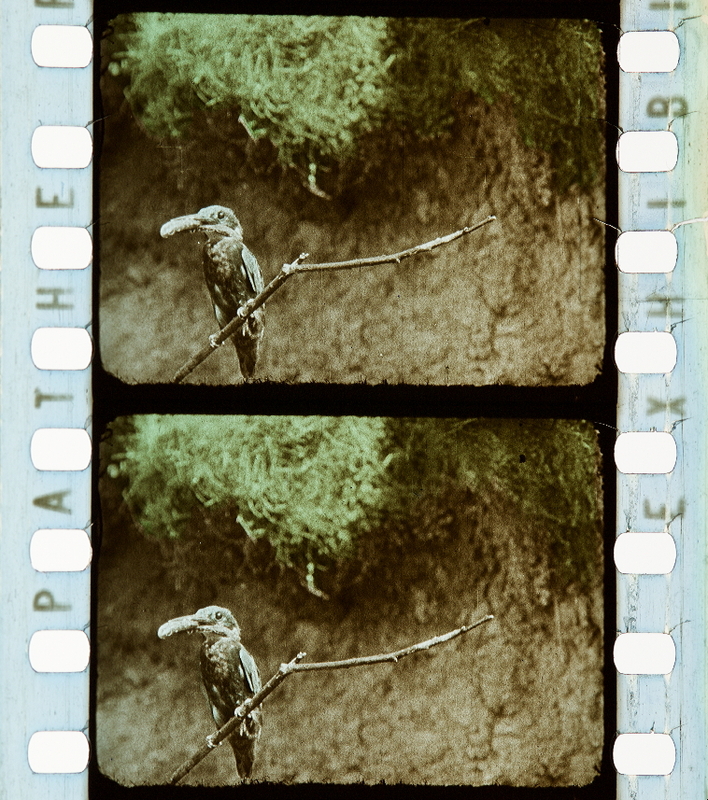 The numbers on Pathé negatives follow a different series which we have not so far related to date. The N.F.A. has very few negatives on Pathé stock of the 1920s. 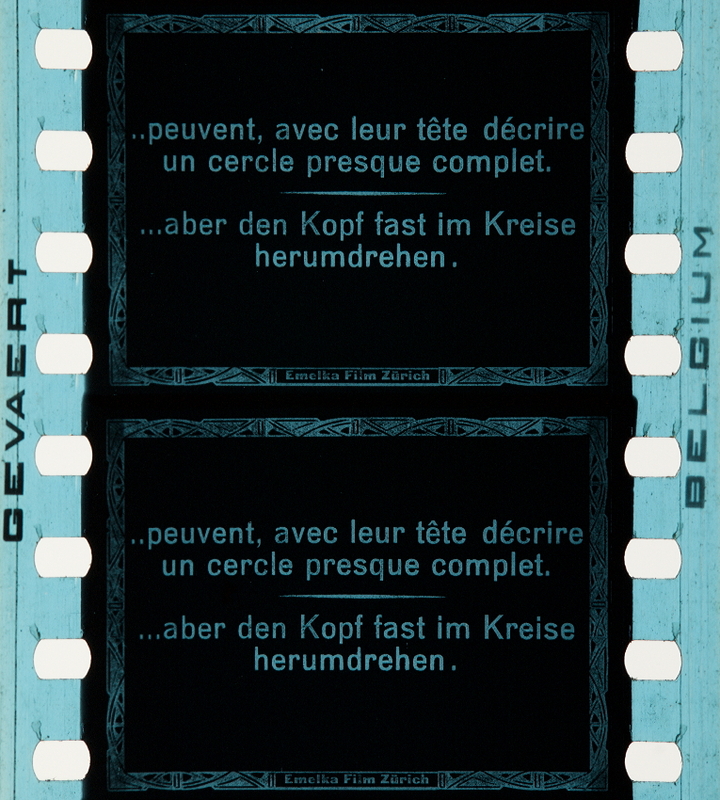 It may be noted that this series of marks terminates at 1927; the year in which the raw stock manufacturing facilities of Pathé were acquired by Kodak. Thereafter the name Pathé still appeared on the film but not the same number series. [Tänze] (? 1920s). 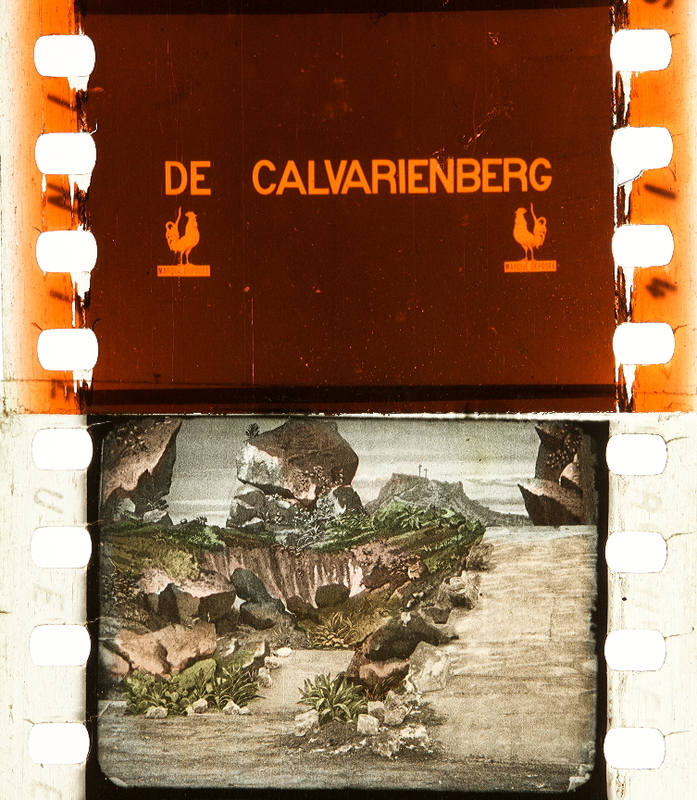 Credit: Deutsches Filminstitut DIF. 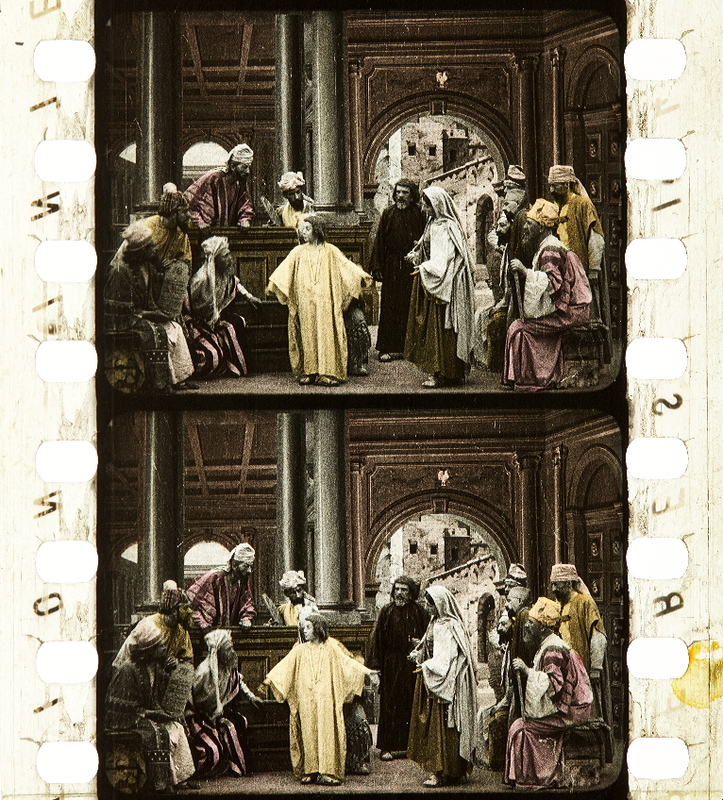 Photographs of the tinted and toned nitrate print by Barbara Flueckiger. 1. A black line between frames. 2. Black round corners to the picture. 3. The image of one circular perforation of the negative on each side. (not very clear). Look at point of arrow. 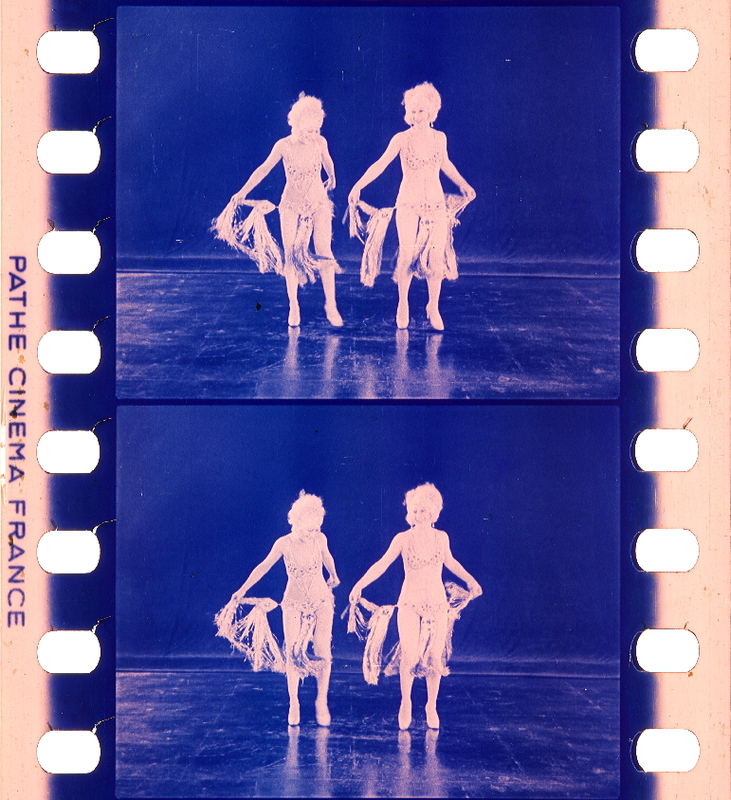 Pathé clearly used some negative with “Lumière” type perforations, but made prints on film with “Edison” type perforations. In their early films around 1900, Pathé often included a board with the letters “P.F.” for ‘Pathé Frères’. In the specimen given, this was, more ingeniously than usual, placed on the “Stars & Stripes” board which the “American” carries (Ill.TM.3/4). (Incidentally, I just cannot imagine any United States citizens representing their national flag with only 9 stripes!!). (Ill.FC.5/6/7/8/9). 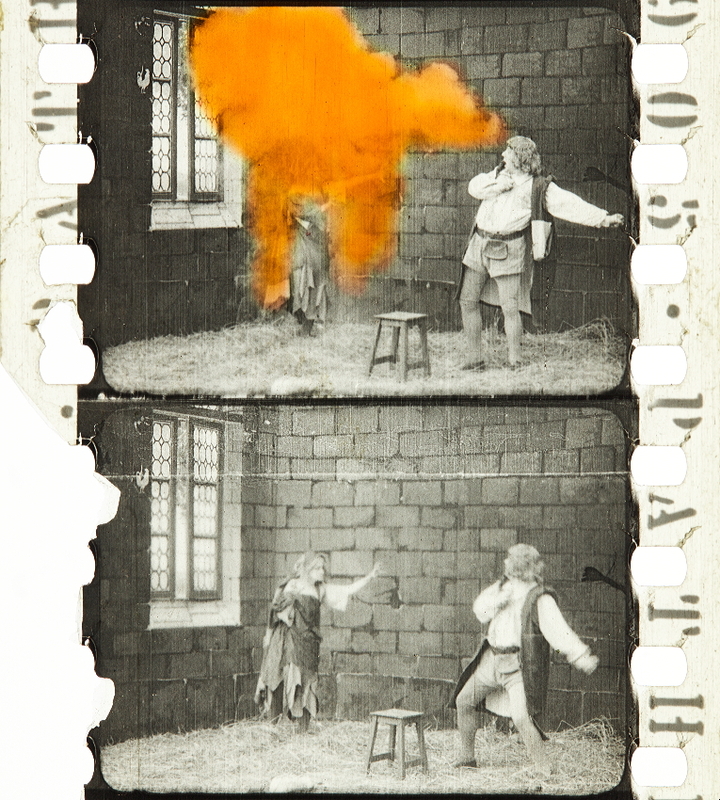 These frames are quite different from any of the Méliès films in a number of ways. The first, most noticeable is that the whole of the perforated margins is black. Also there is only a thin line between the frames or none at all. The picture has sharp square corners, and occupies the whole of the width between the two rows of perforations. The frame-line of all of them is through the perforation. All of the [National Film] Archive’s original prints of the films of Robert Paul from his beginning in 1896 up to 1904 have this appearance. I examined 50 Selig Polyscope films. The inter-titles of the Selig films are of four main kinds, and there are variations within each kind. 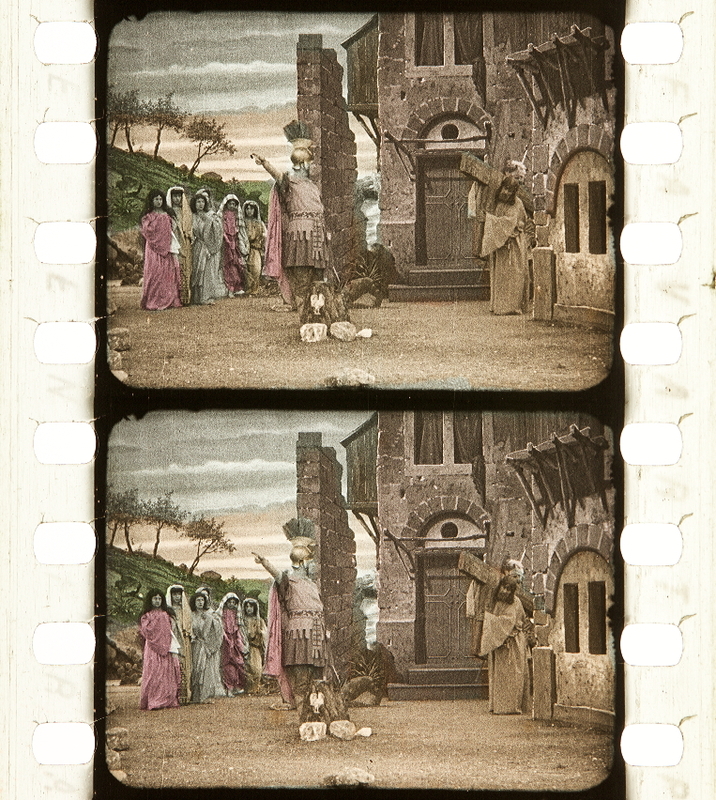 The earliest ones, on the films of 1908 & 9, have a plain background, tinted red, and have the words in all capital letters. The size of the letters varies from film to film. These are just not distinctive at all. The form of inter-title used, roughly, through 1911 has the wording within a large diamond-shaped border. There is a letter ‘S’ in the top and the bottom corners of the diamond, (Ill.TS.92), These were tinted Amber. From, early 1912 through to mid 1914, variations on that style of title appeared. First, the title of the film appeared in the top of the diamond, (Ill.TS.93); then what seems to be a production number appears in the bottom left-hand corner outside the diamond, (Ill.TS.94); then a small white square appears in the left and right-hand corners of the diamond, (Ill.TS.95); then the name ‘Selig Polyscope Co.’ appears in the bottom right-hand corner, (Ill.TS.96). 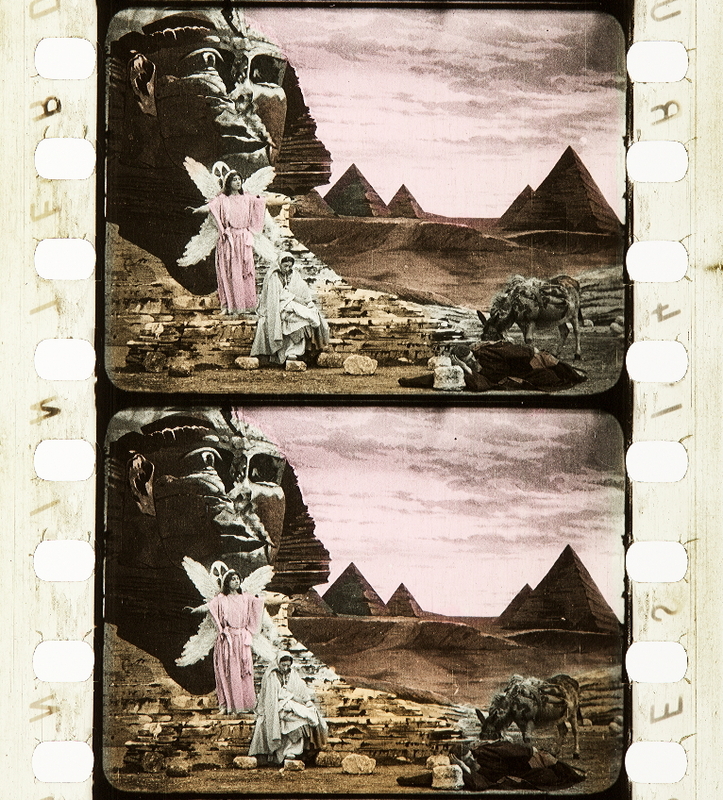 These were tinted or black & white as shown on the Selig film list. About the middle of 1914 another style began to be used. This consisted of a rectangle with a little diamond in each corner, and a letter ‘S’ in each diamond. These all have the title of the film within the top of the border. Some have the name of the Selig Polyscope Co. within the bottom of the border, and some have a copyright date also, but I have not been able to relate these variations more closely to date. (Ill.TS 97). There are what appear to be some inconsistencies in the scheme indicated in Paragraphs 8.14 to 8.16 [above]. This may be explained in connection with the sources from which I had to obtain the dates. 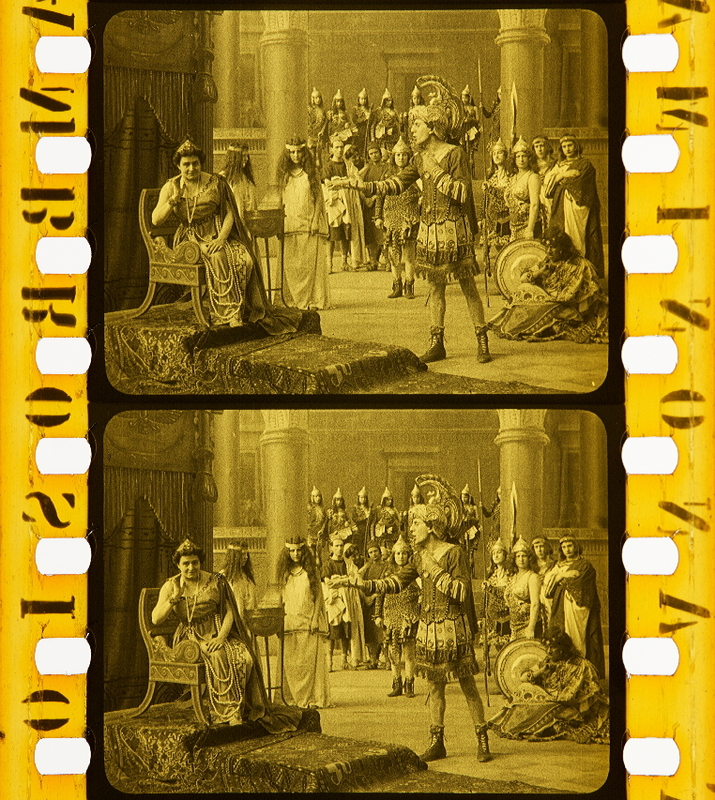 These came from three sources; the Library of Congress copyright registration; American Film Index 1908-15 by Einar Lauritsen & Gunnar Lundquist; and from the Bioscope. There can be a difference amounting to months in the date of copyright registration, of American release, and of the appearance of the film in Britain. I was not able to find reference to all the films in any one of the sources. It could be that in some cases the date which I have found is of a re-issue. All the Selig films of 1915 use the convention that narrative titles have a border and speech titles have plain grounds. 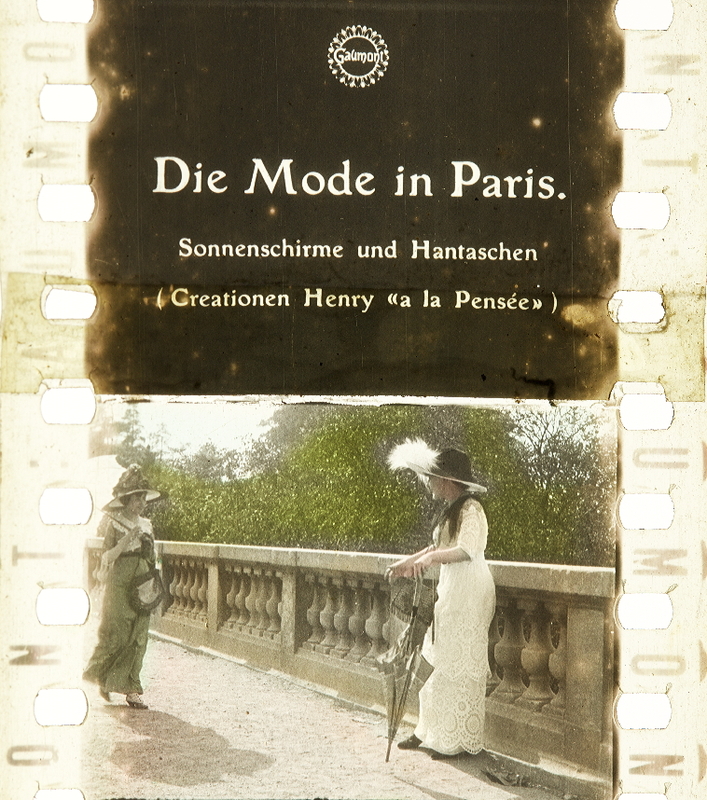 Within the date range stated, in September 1913, we have two films with a different title style, (Ill.TS.98). USA = Has the edge mark of (Ill.PM.15) including the letters ‘U.S.A.’. EM = Has the edge mark without the letters ‘U.S.A.’. 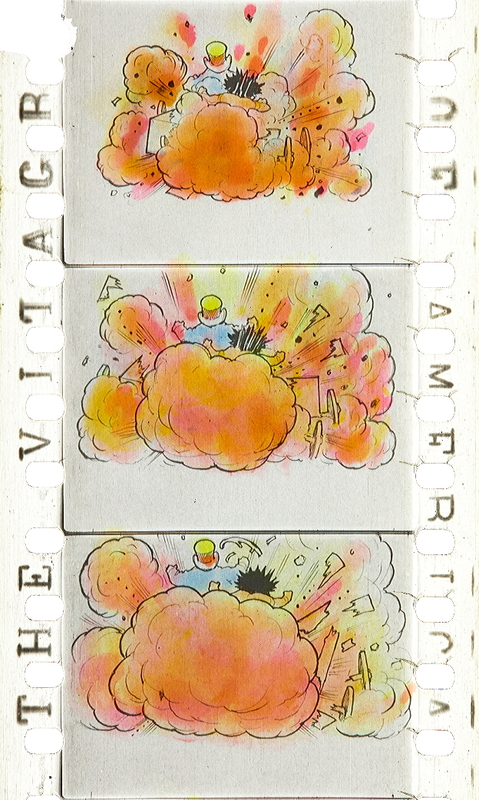 The film has inter-titles of the style shown in the illustration indicated. The letter states the tint of the title. There are a few titles with a pinky amber colour. It may be that these represent a period of change from Amber to Pink. They are indicated by ‘AP’. 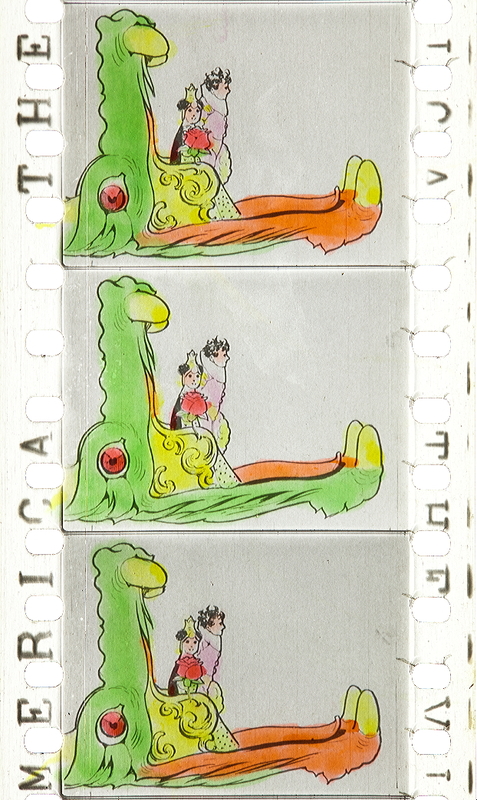 The earliest of the Selig films had a plain background. However, Ranch Life in the Great South-West has a production number in the bottom right-hand corner. Still Alarm has a production number within the diamond, below the wording. “Note that two of the films, Millionaire Milkman, and Old Curiosity Shop, both of 1912, bear the edge marks of Pathé, illustrated in (Ill.PM.6). These films were clearly printed by Pathé. They have the appearance of Pathé as regards the emulsion surface, and also the Pathé shape of perforation. There can be no doubt, however, that these are Thanhouser productions since the Thanhouser trade mark appears in some of the scenes. 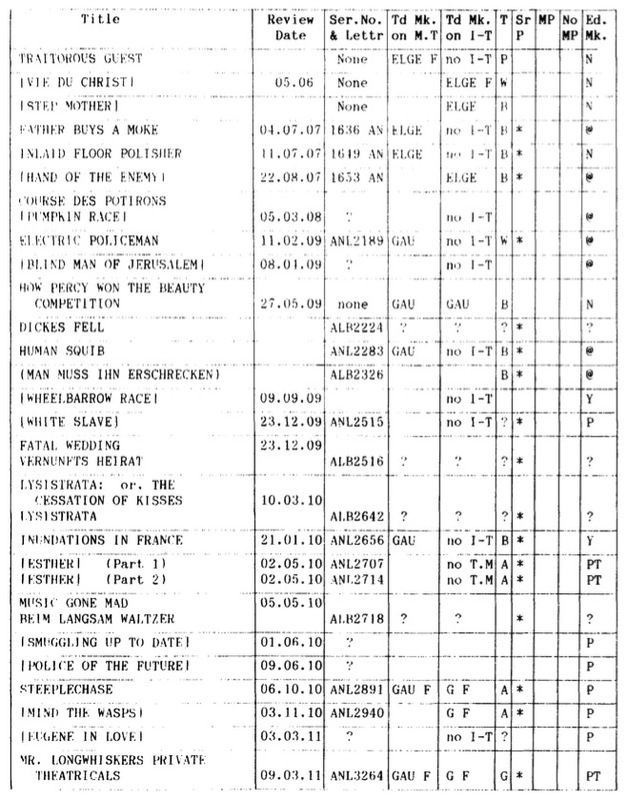 Also note that these films do NOT have the frame characteristics of Pathé’s own productions. It appears, therefore, that Pathé distributed at least some Thanhouser productions in about 1912. 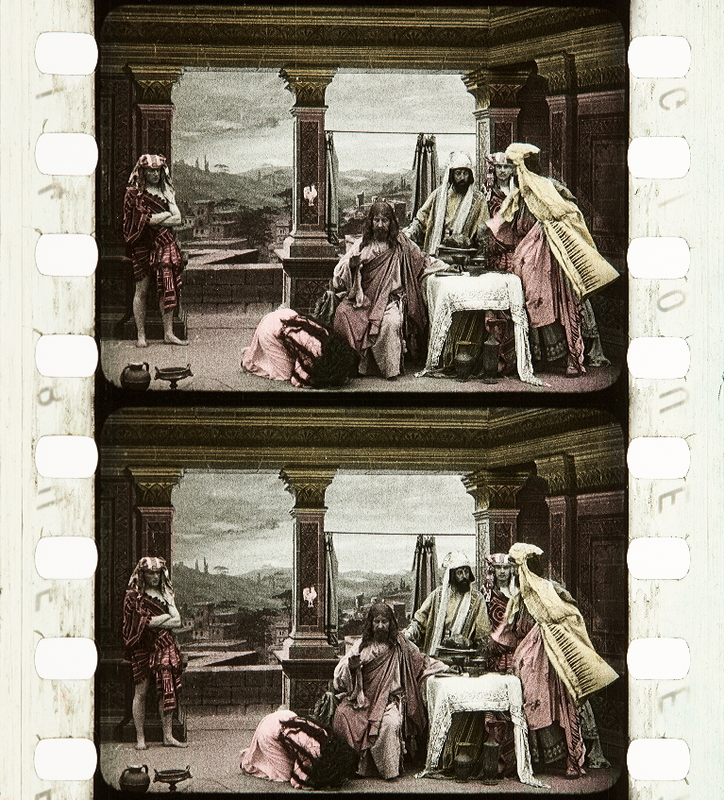 It is known that Pathé printed and distributed some films of Georges Méliès in 1912, so it is quite credible that they distributed others in about the same period. Apart from the two films which have Pathé’s mark, none of the films has a Producer’s edge mark. 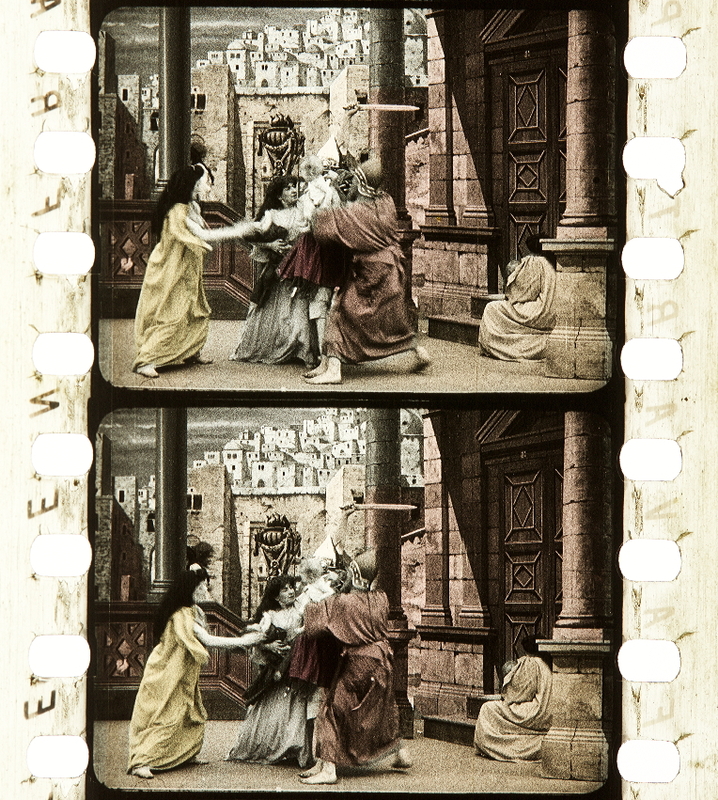 ALL of the films from mid 1913 onward are printed on Eastman stock and have the edge mark corresponding to their time of production. So one may be fairly safe to assume that any film of that period which is not on Eastman stock is not a Thanhouser film. “There is less consistent clear characteristic with Thanhouser than with some other producers. In almost all the films which I have inspected the frame line lies in mid-space. The inter-title styles do provide some indication of date. The titles of the films of 1910 and 1911 are as (Ill.TS.65). Those of 1912 and 1913 are similar except that the film title appears on the inter-titles. 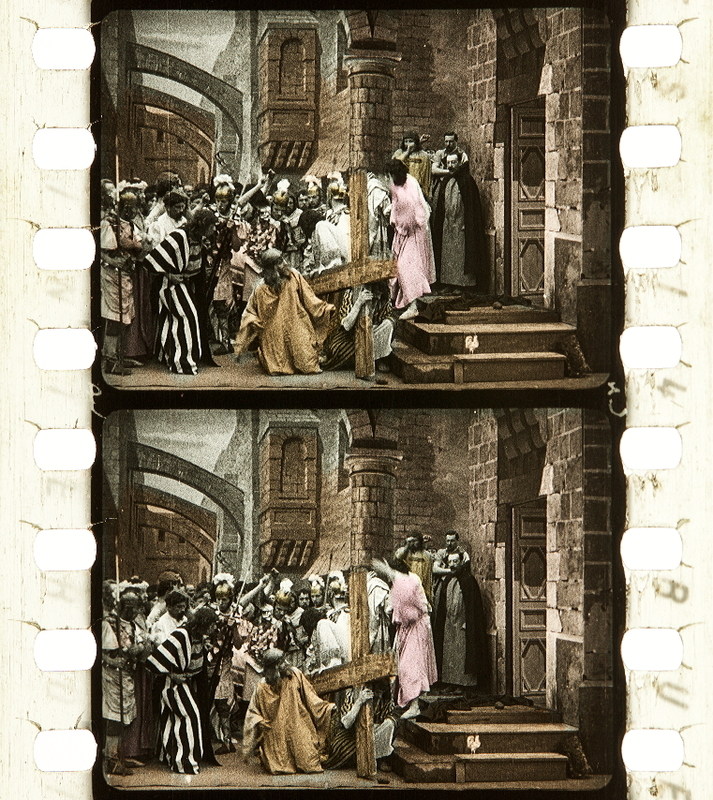 In the earliest film of 1912 which we have it is at the top of the frame, (Ill.TS.66), while in the others it is at the bottom, (Ill.TS.67). Further, the inter-titles of four of the films of this period have the film title enclosed in curved brackets, (Ill.TS.68). These are all from the second half of 1912. This feature may help further to determine the dates of otherwise un-dated films. 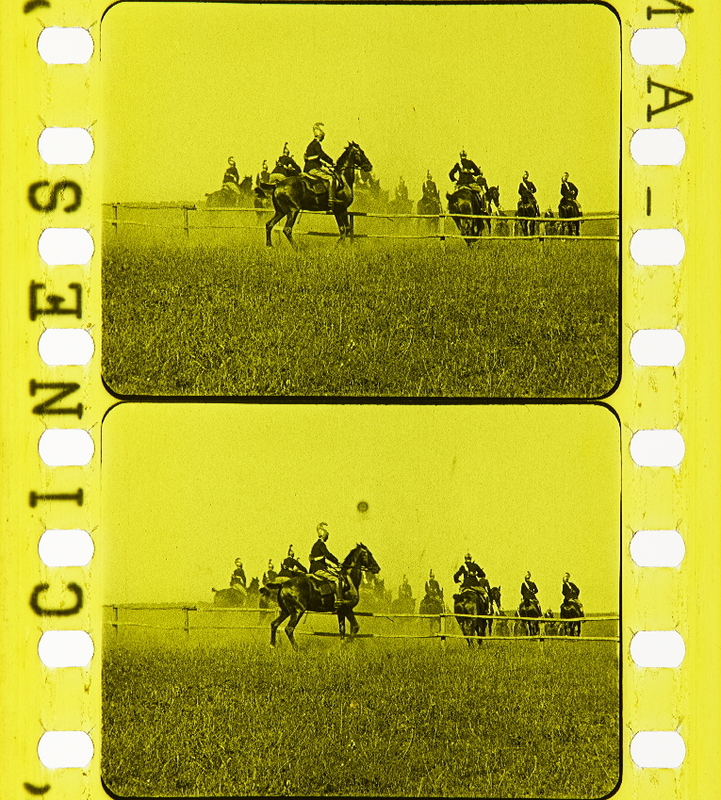 Until at least the end of 1913 the titles were tinted amber, (with the exception of the two films which were printed by Pathé, but at some time in 1914, the tinting ceased and they were black-and- white, (Ill.TS.69), while the style of the titles remained otherwise the same. Of the four films which we have of 1915, two have main and inter-titles in the style of (Ill.TS.70/71). One has no inter-titles, and one has a unique style having the name ‘Fallstaff’ in it; (Madam Blanche: Beauty Doctor), It seems clear that there was some association between Thanhouser and Fallstaff. This is a case where narrative titles have a decorative border, and speech titles are on a plain ground, (Ill.TS.73/74). The N.F.A. has five Thanhouser films which have the trade mark appearing in scenes. These are all in the date range 1909 through 1912. None have been found with trade mark after 1912. See (Ill.TM.17), and (Ill.TM.18). I have chosen to use these two because they show peculiarities. (Ill.TM.17) is a comparatively rare case of a trade mark appearing in an exterior scene. It may be that it is a studio shot depicting an exterior. This is from The Old Curiosity Shop, based upon the novel of Charles Dickens. This is reviewed in the Bioscope of 22.02.12. This film was clearly printed by Pathé. 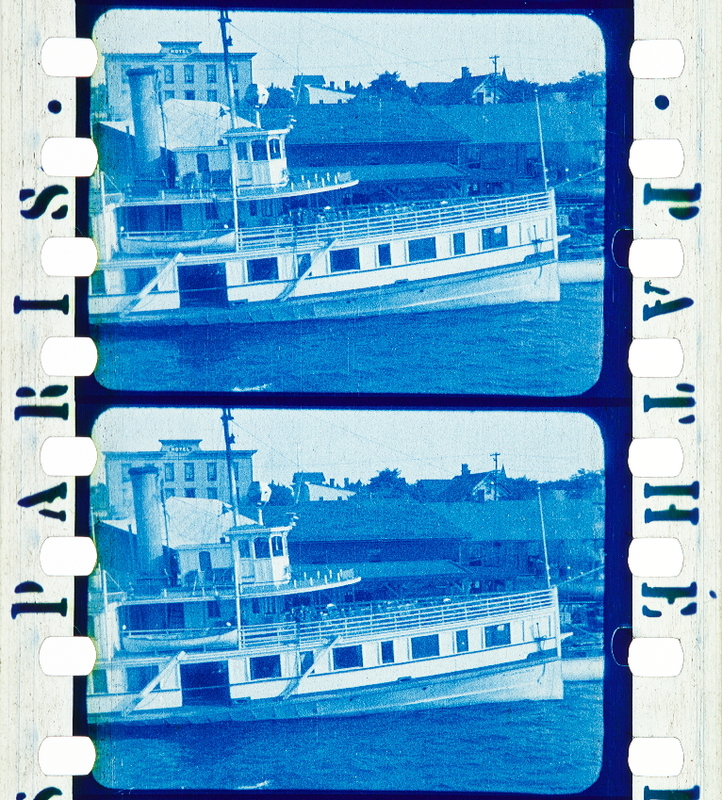 It has Pathé’s edge mark, Pathé perforations as in (Ill.P.5), and the whole intangible feel and appearance of Pathé film – except for the frame characteristics, (Ill.FC.42) and the Thanhouser trade mark. The title of the film, which may be on the film or may have been discovered by research. The date of the earliest reference which I have found, intheorder ‘day’,’month’,’year’. The inter-titles are in the style illustrated in that Title Styles illustration Number. The letter indicates whether the title is tinted Amber ‘A’ or is black-and-white ‘W’. The frame characteristics are as the illustration indicated. ‘?’ indicates that I do not know; the character of the original is obscured on the copy seen. There is ‘TM’ in this column when the Trade Mark appears in any scene. It may be noted that no trade marks appear in scene after 1912. Of the films in which the film title appears on the inter-titles; the word ‘curves’ is in this column when the title is enclosed in curved brackets. Note that all the films whose titles have the curved brackets are in the second half of 1912. 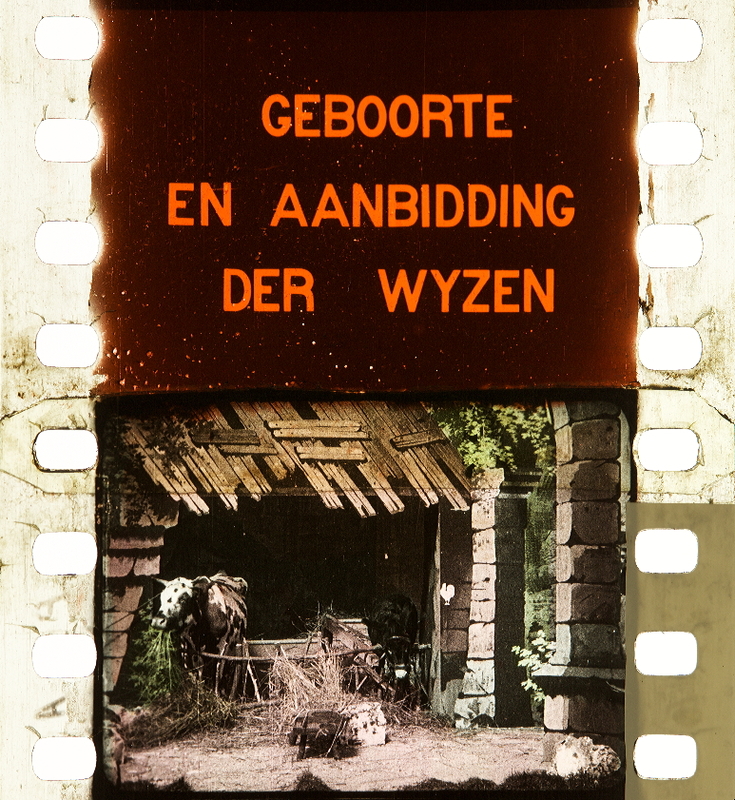 Two films have the Pathé edge mark with the wording as in (Ill.PM.6). These are Old Curiosity Shop and Millionaire Milkman. Vitagraph films printed in the United States of America from 1909 onward had the edge mark ‘THE VITAGRAPH Co OF AMERICA’ (Ill.PM.12). Little Nemo (USA 1911, Winsor McCay). Credit: Courtesy of The Museum of Modern Art Department of Film. Photographs by Barbara Flueckiger. “[…] the style and tinting of the inter-titles was changed from time to time, and this can provide some indication of the date of the films. 1908 The lettering is less ornate and sometimes the Vitagraph trade mark of an eagle and ‘V’ appears. (Ill.TS.30) is black & white. (Ill.TS.31) is tinted amber. 1909 The inter-titles used through 1909 were tinted amber. This required that the titles were all spliced into the copies, so that there is a join at the beginning and end of every title. In this year also the edge mark “VITAGRAPH CO.OF AMERICA” or “VITAGRAPH CO. PARIS” was introduced. (Ill.TS.32/3/4/5) Copies for distribution in Europe were printed in Paris. 1910 The 1909 style seems to have continued into 1910, but in this year was introduced a new style with the wording placed in a decorative border. These titles were nearly always tinted blue, otherwise amber. (Ill.TS.36). (Ill.TS.37) appears to be a special title style designed to suit the particular subject. (Ill.TS.38) continues the same design as (Ill.TS.36). 1911 I considered whether the presence of the trade mark on the inter-titles was significant, but it seems to be included just when there is not much wording, though it does not appear at all from 1915 onward. The two specimens from 1911 (Ill.TS.39/40) have the same decorative border as the 1910 ones. Notice that (Ill.TS.39) has a plain block style of lettering with no serifs, unlike the other 1910-1911 ones. 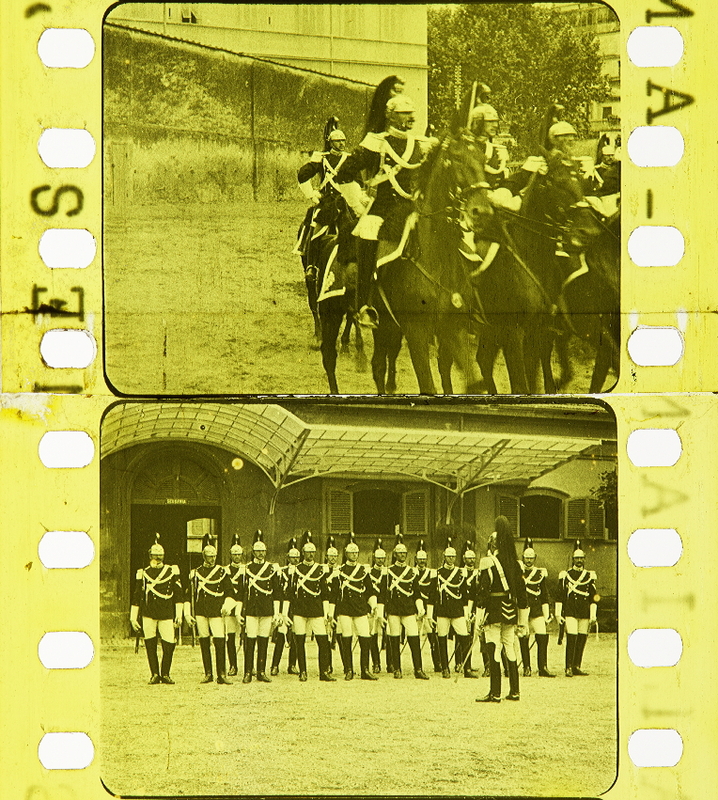 1913 (Ill.TS.42) has the same decorative border as (Ill.TS.41) but, perhaps because it is a factual film, does not have the film title. (Ill.TS.43) does have the film title. Also note that while the border is very similar, the name ‘Vitagraph’ is incorporated into the bottom of the border. 1914 The same style continued in use into 1914. From this year also most of the copies have no edge mark, though there are some later copies which have it. Also in this year another change of practice began. Up to this time all the titles were spliced into the copies. 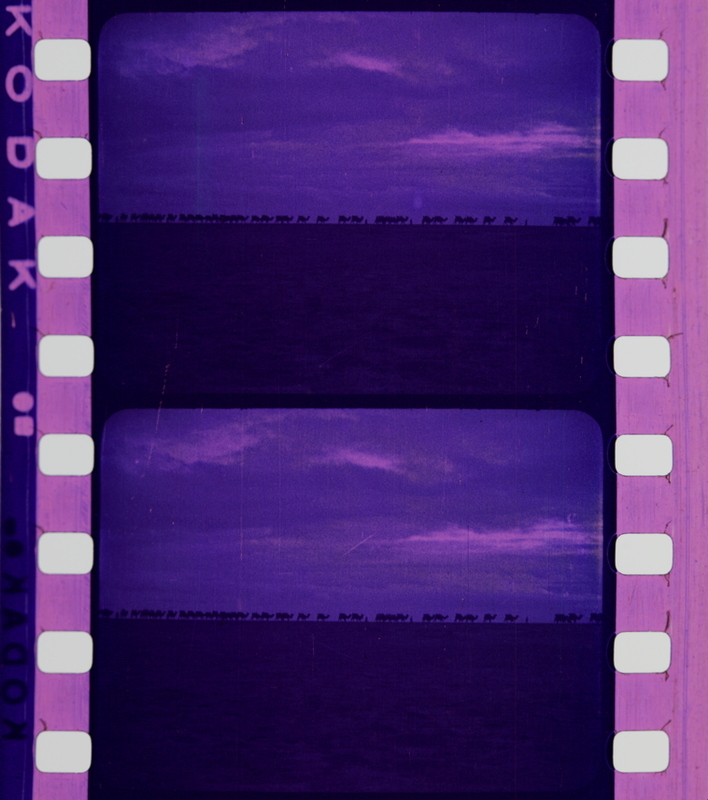 Now some of the films had their titles spliced into the negative and printed in one continuous piece with the adjacent picture, so that (apart from joins due to damage) there are no joins at beginning and end of titles, and each title takes the tint of the section of film in which it is placed, instead of all the titles in the film having the same tint. 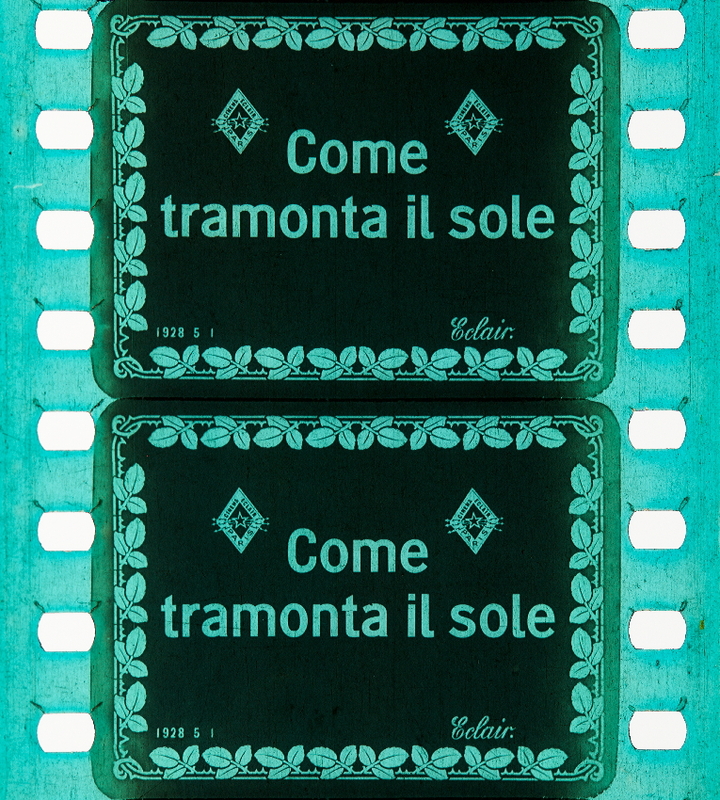 1915 (Ill.TS.49) exhibits the same decorative border as (Ill.TS.43), but observe that the film title does not have the line above and below it. When titles were inserted into the prints their tint is blue. There also seems to have been less use of tinting of the picture. 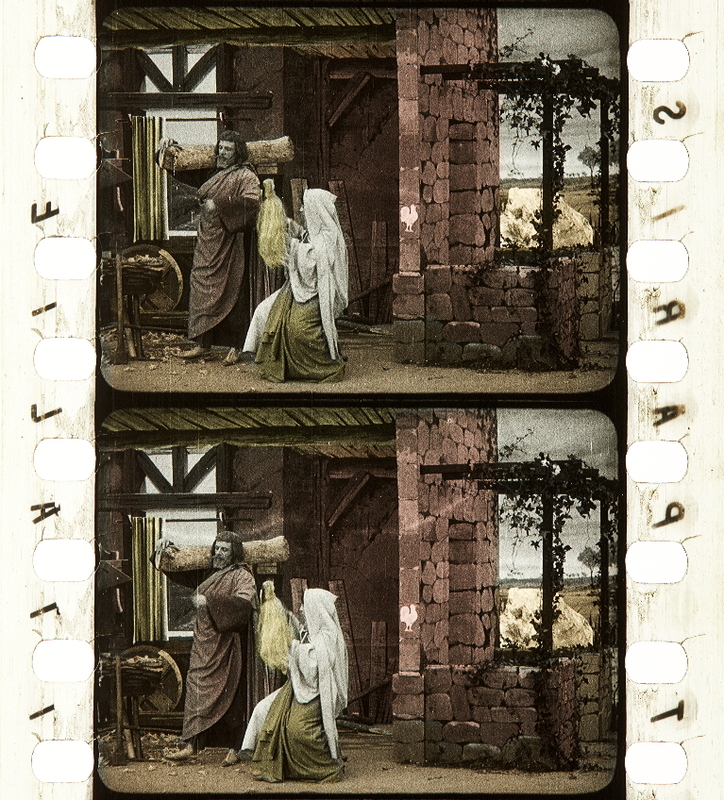 1916 (Ill.TS.50-53) The name ‘Vitagraph’ continues to appear in the decorative border, but different styles of border are used and the film title is not always included. 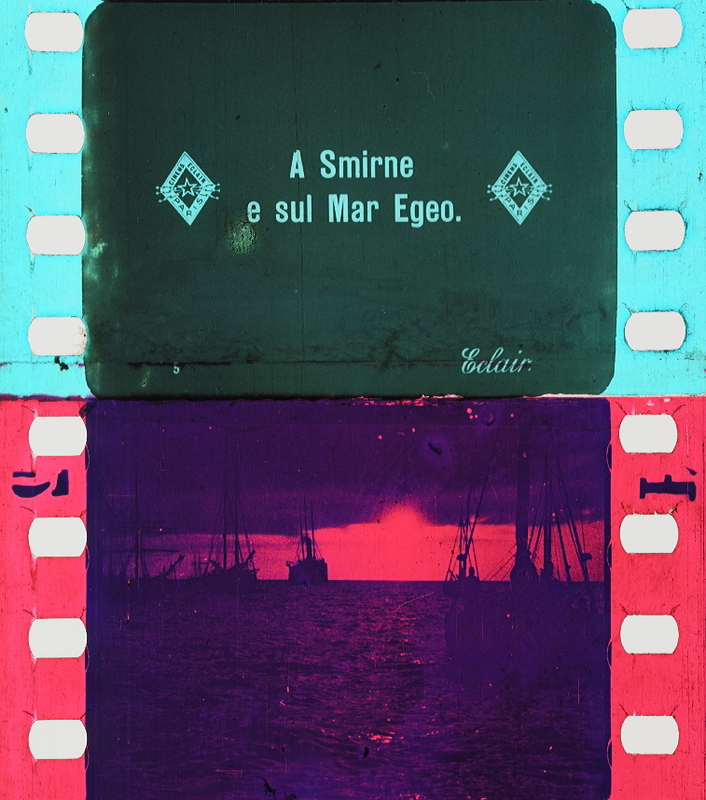 1917-1919 There seem to have been very few Vitagraph films in these years. Those in the N.F.A. are all comedies. 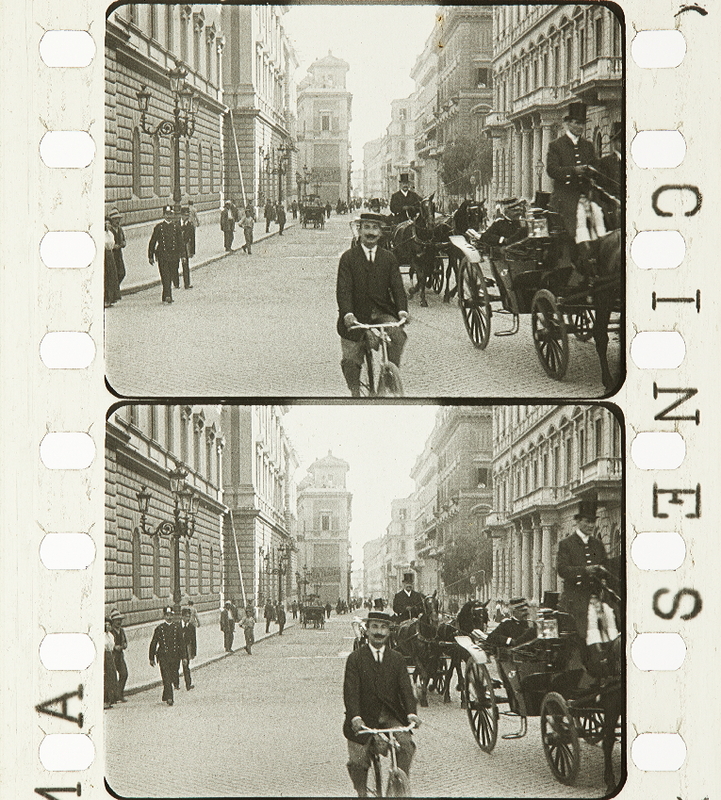 (Ill.TS.54-56) are all from films of 1917, but note that (Ill.TS.54) was also used in 1916. (Ill.TS.55) is similar to (Ill.TS.51) of 1916, but the name in the border is “Greater Vitagraph”. The style of (Ill.TS.56) of 1917 is similar to (Ill.TS.57) of 1918. (note “Vitagraph” and “Greater Vitagraph”. (See Ill.TS.57). this is from the same film as (Ill.TS.58). This represents the convention, which became widely adopted, that narrative titles are put in a border, and speech titles have a plain background. (Ill.TS.59) is from a film of 1919, and the other ‘Vitagraph’ film of 1919 in the N.F.A. has the same style of inter-title. Vitagraph placed their “eagle and ‘V’ ” mark in many films through the years 1907 to 1910 inclusive. I have found no Vitagraph film later than 1910 having the trade mark in any scene. The style of the mark varies. (Ill.TM.13) Liquid Electricity – 1907. Here it is solid white. (Ill.TM.14) Auto Heroine – 1908. Dark in contrast to the white wall. (Ill.TM.16) Daisies – 1910. Among several other pictures etc. adorning the wall. The Warwick Trading Company, of Britain, printed its name [THE WARWICK TRADING Co LIMTD. LONDON] in the margins of some films over a period which I have not got precisely defined but which was approximately 1910-14, (Ill.PM.17).